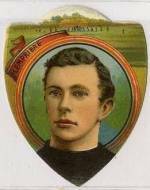 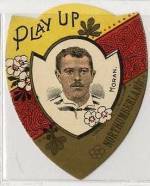 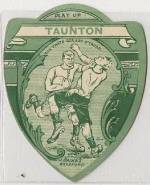 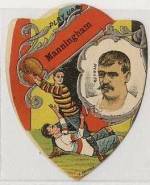 I have a true passion for these cards, primarily because of the locality of the issuer and secondly for the vast quantity of minor teams he covered. 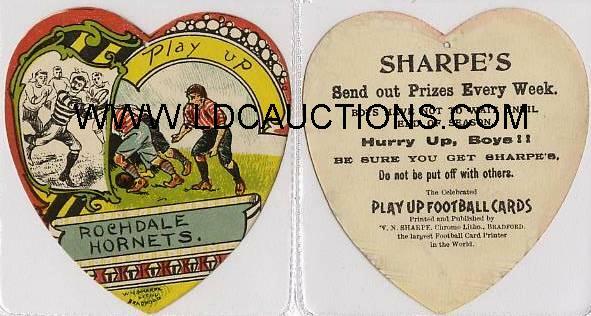 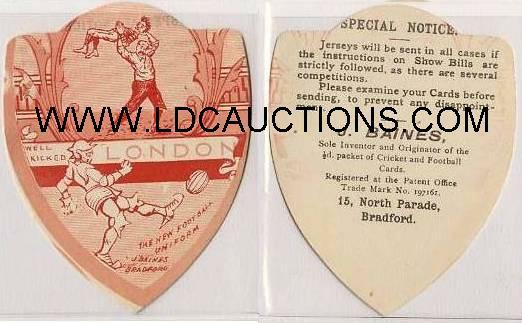 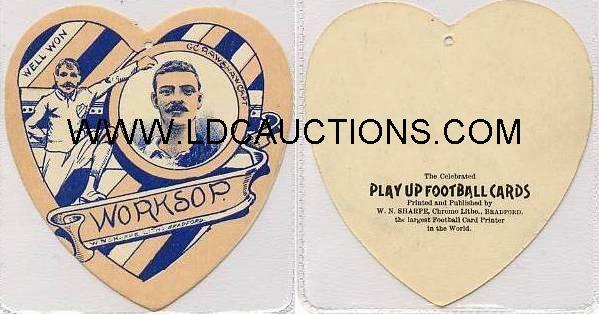 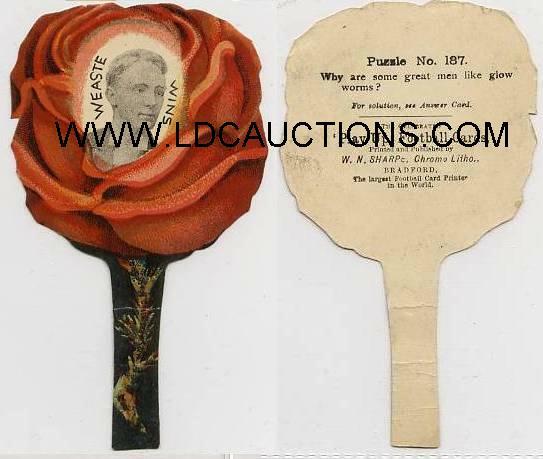 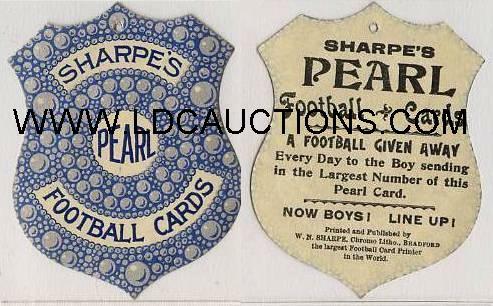 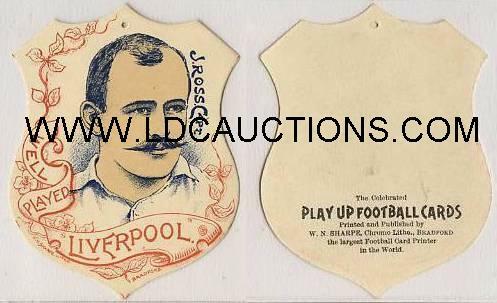 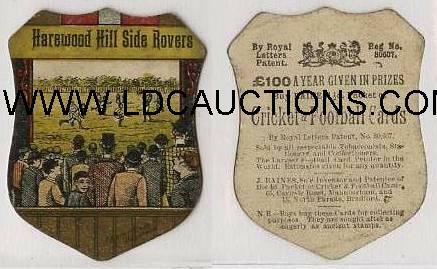 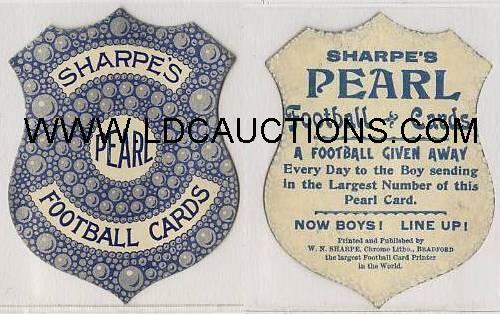 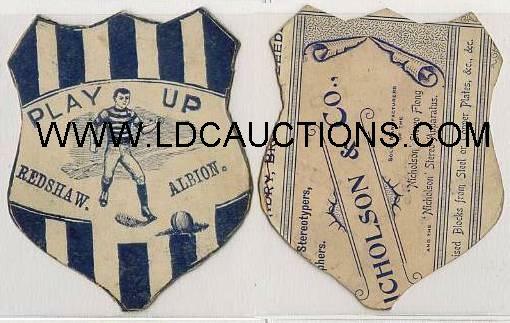 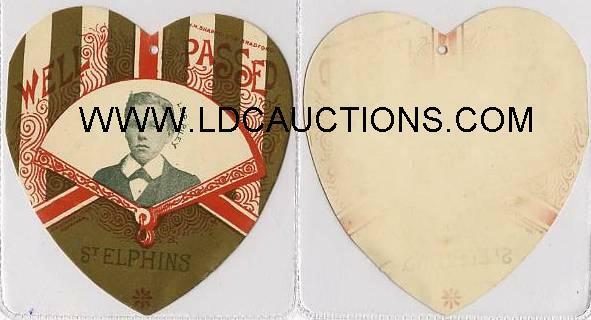 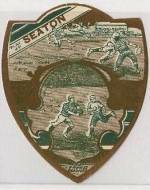 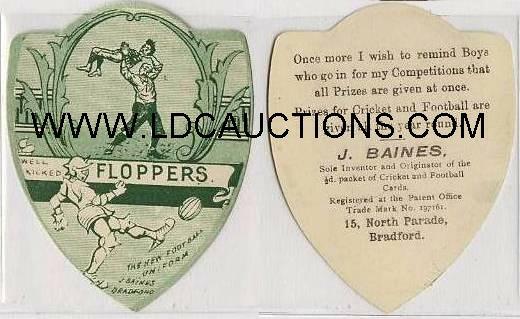 For our own collection we are always willing buyers of these cards, or any similar issues. 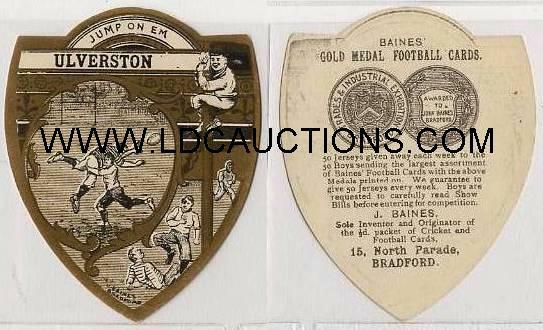 If you have any not listed here please let me have a nice scan of the front and back to help me build a full catalogued list for the enjoyment of all collectors. 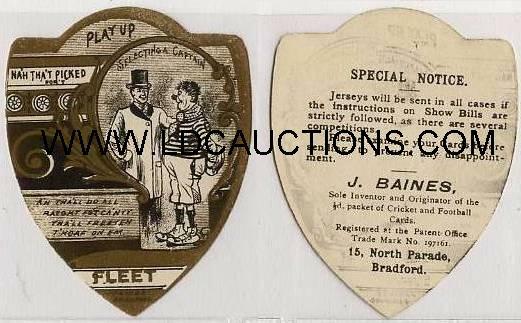 If you use these scans elsewhere please give a credit to my own site for the initial supply, thats all I ask in return. 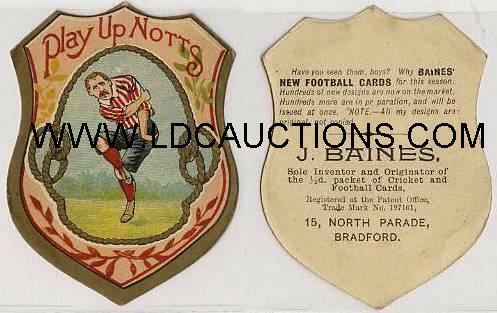 I will be adding to these pages monthly with a view to holding at least 1200 different images so please keep calling back. 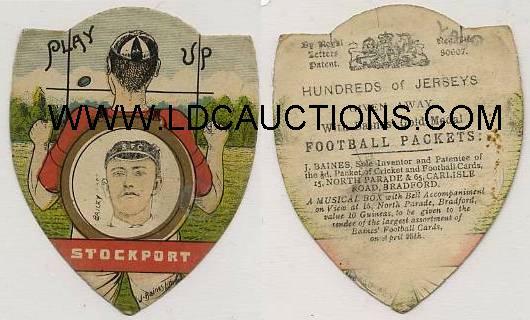 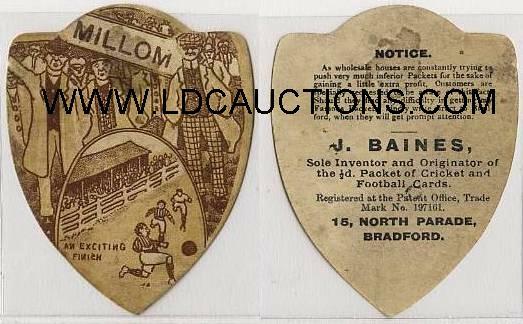 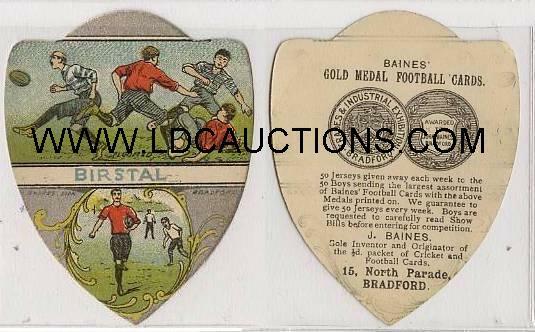 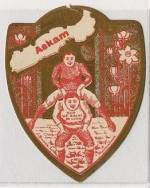 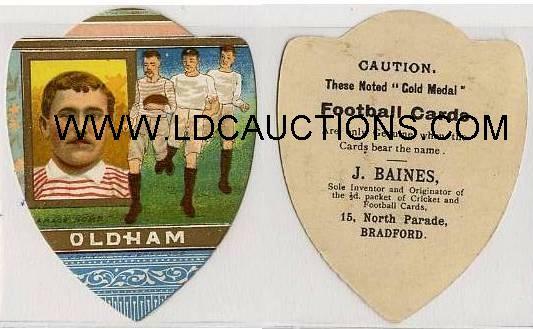 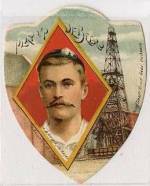 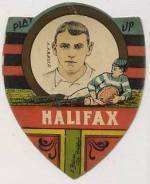 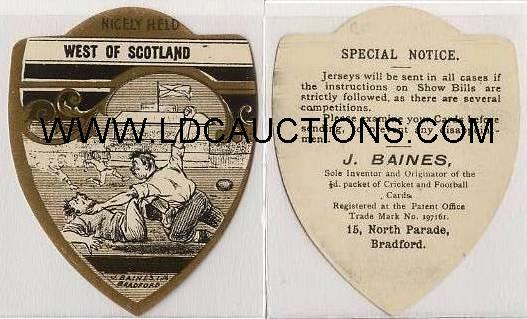 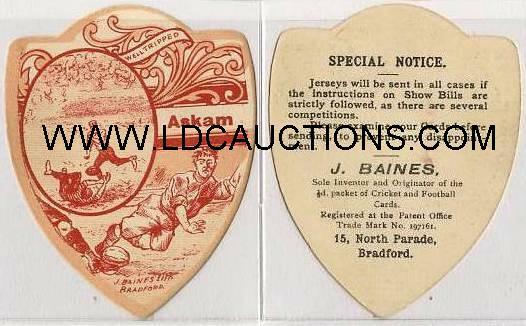 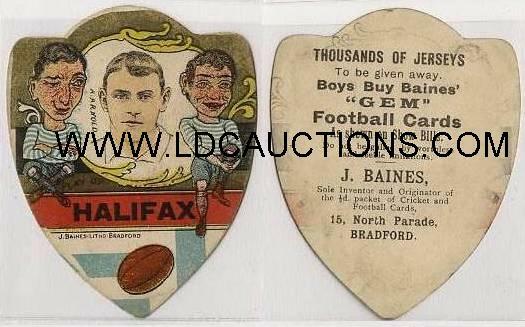 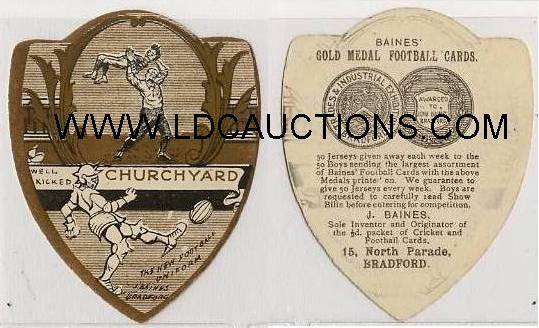 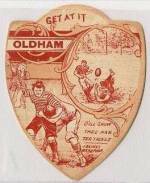 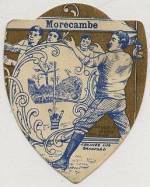 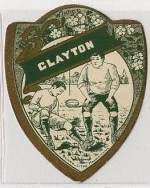 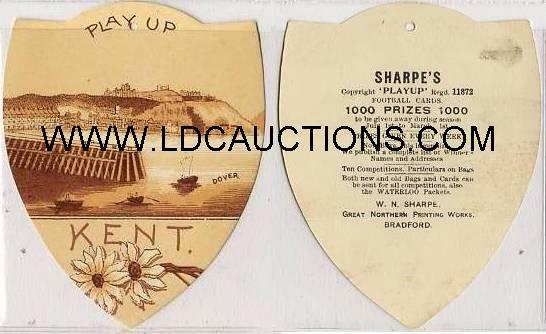 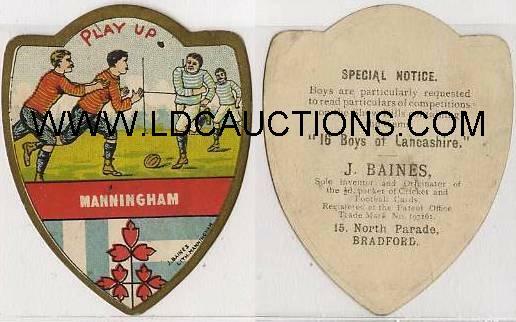 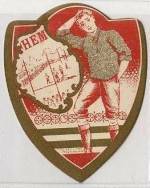 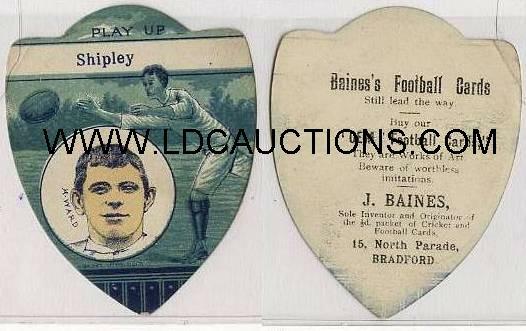 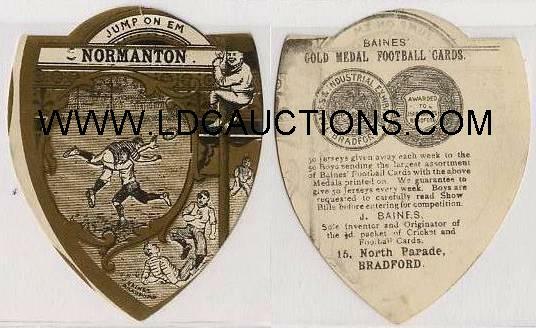 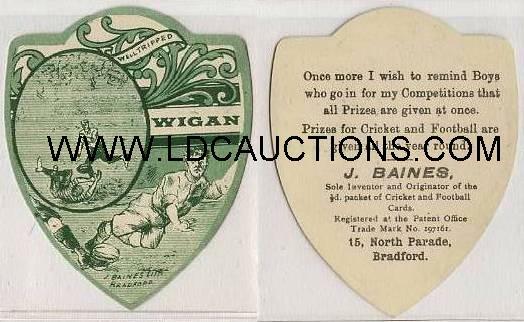 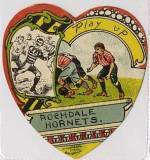 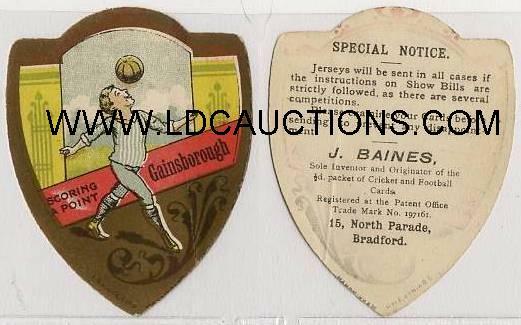 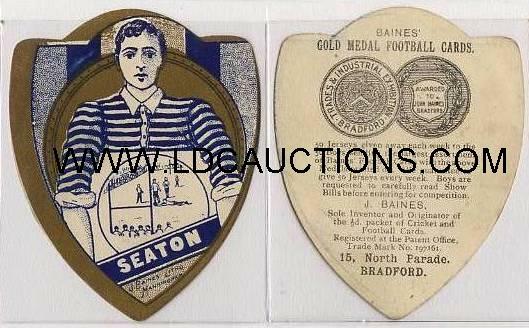 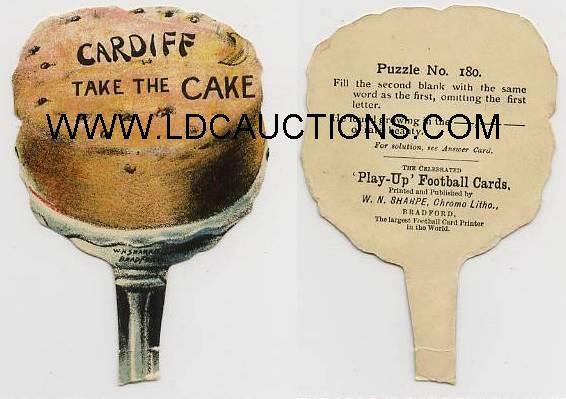 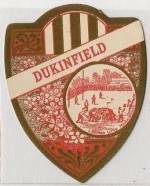 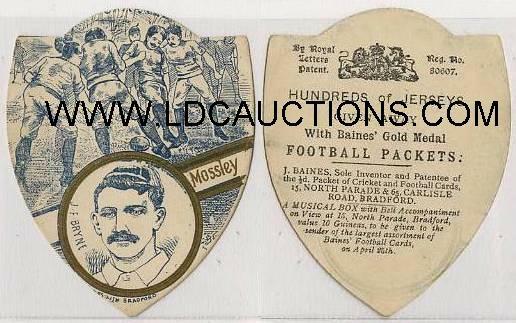 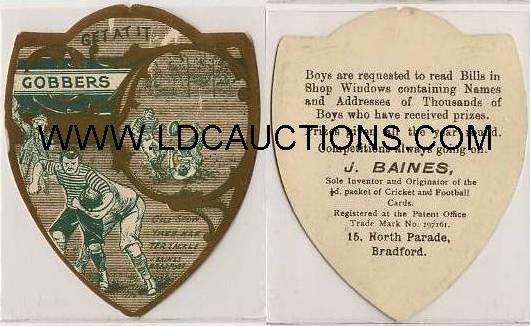 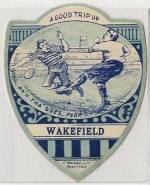 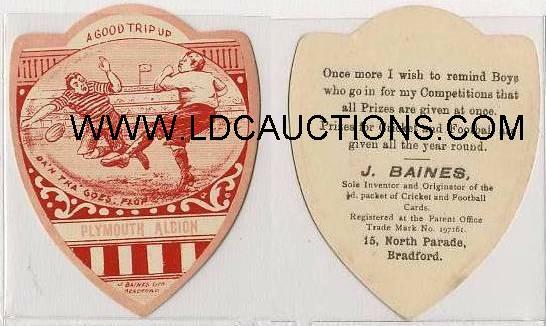 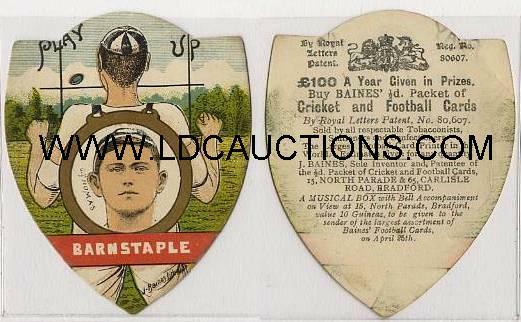 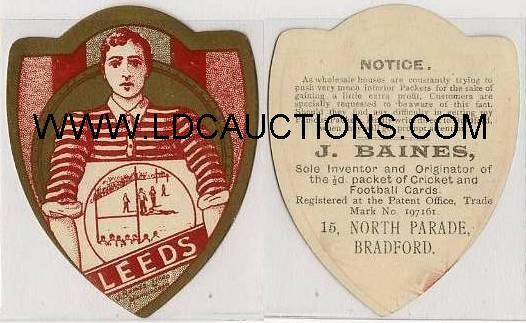 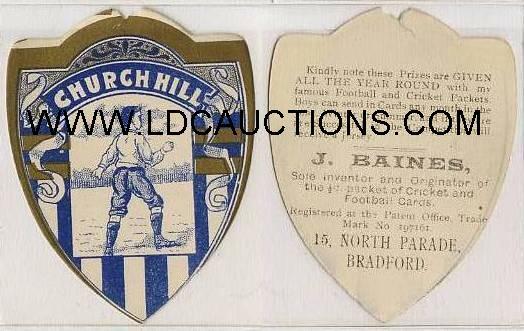 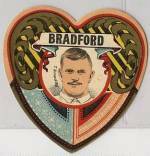 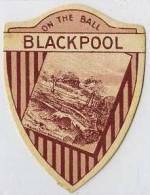 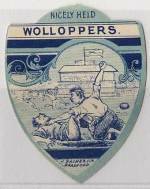 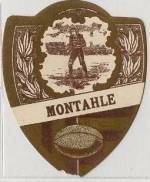 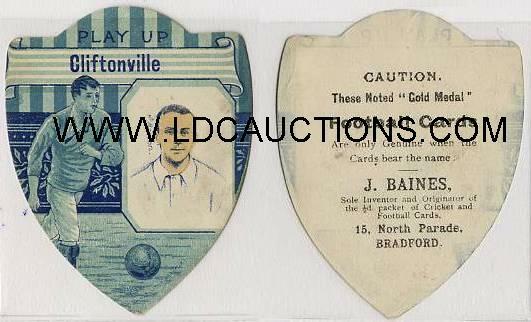 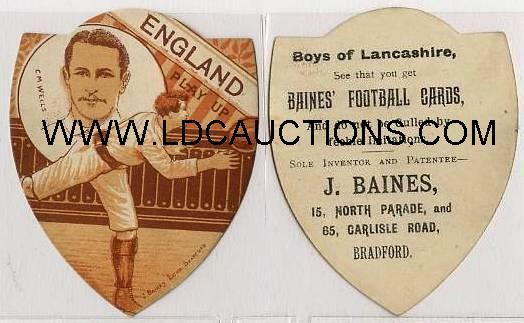 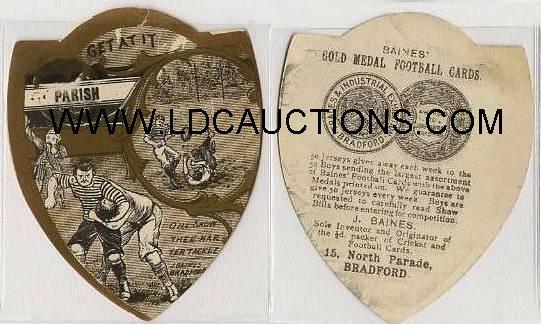 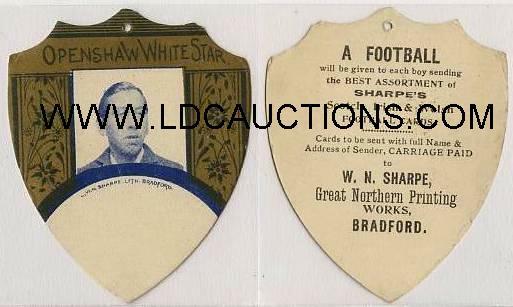 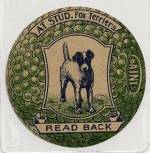 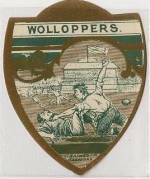 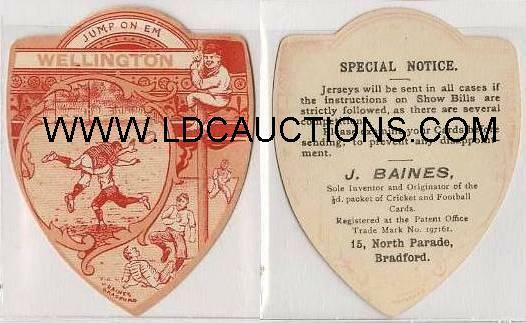 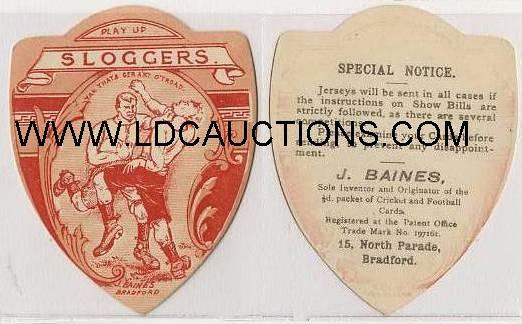 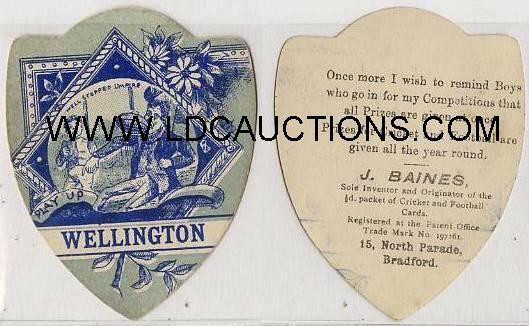 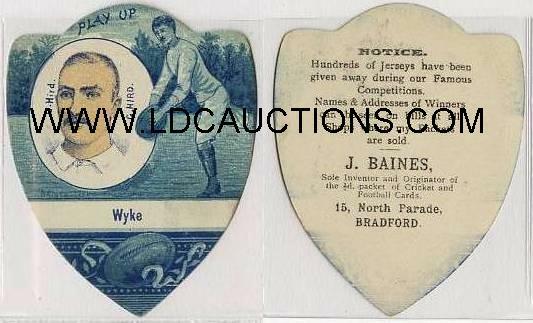 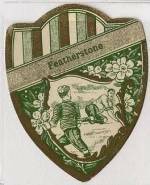 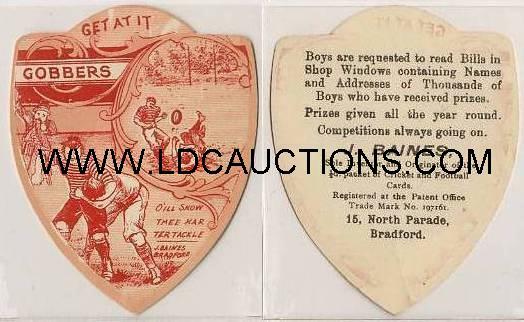 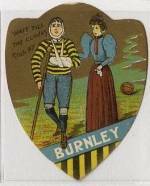 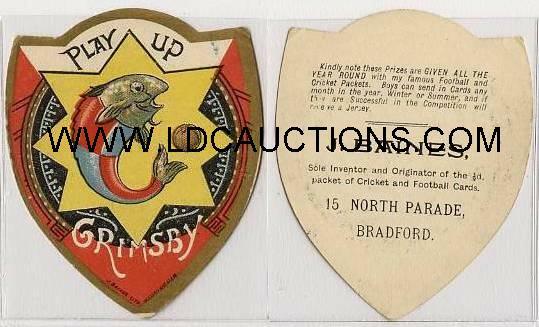 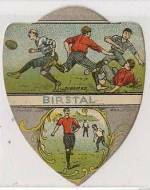 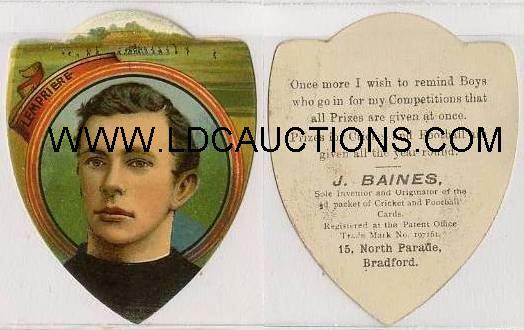 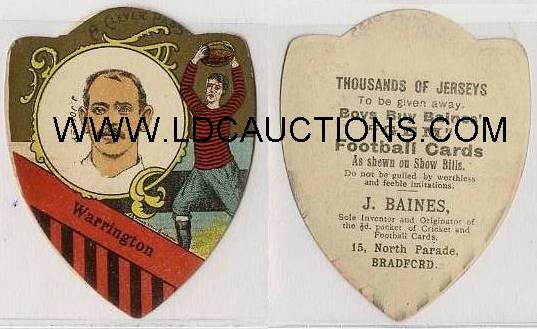 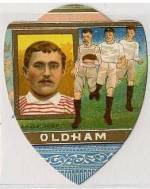 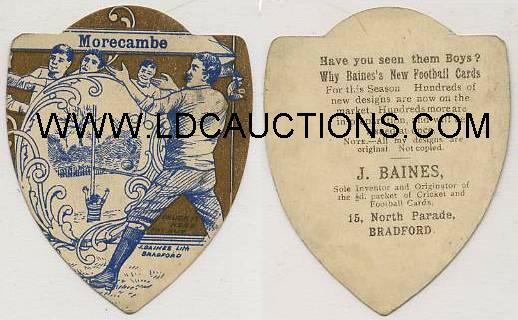 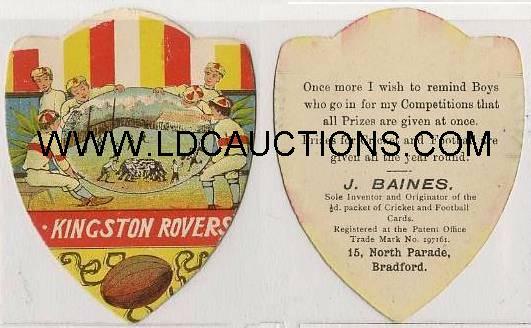 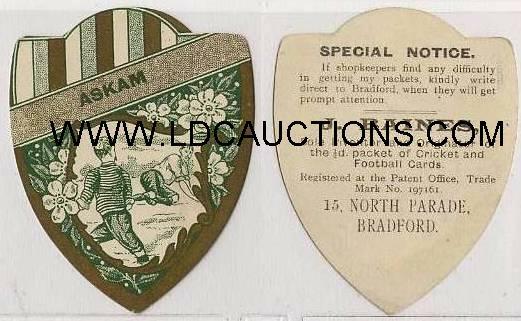 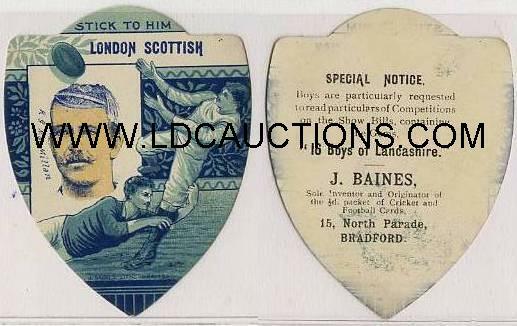 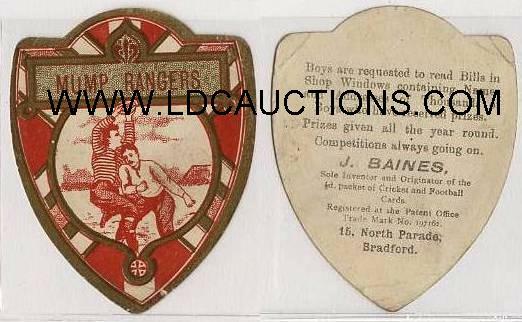 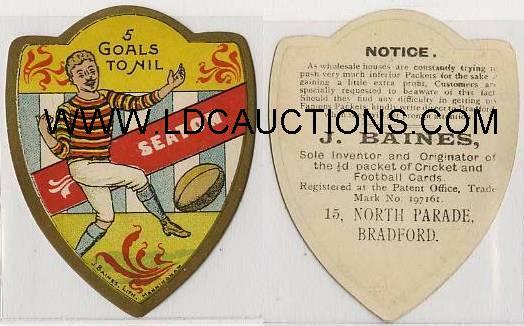 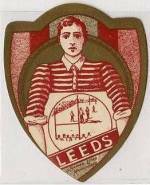 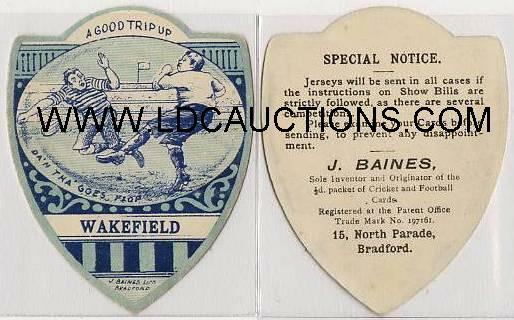 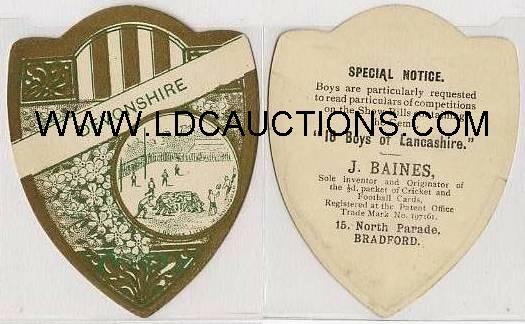 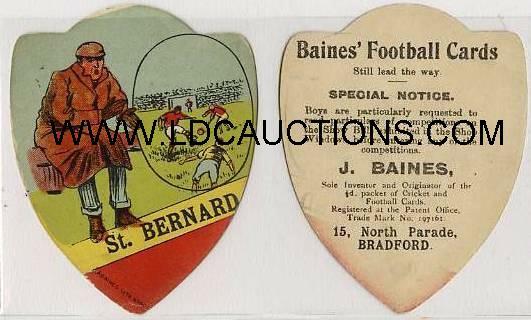 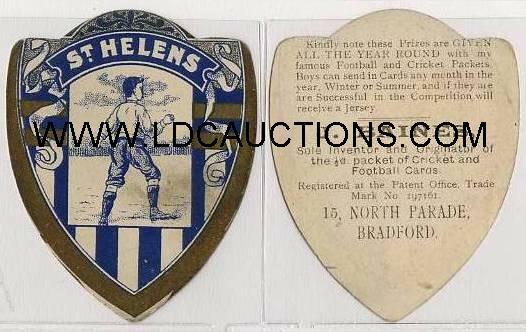 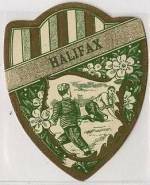 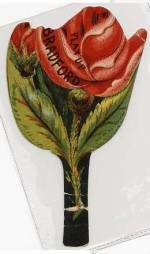 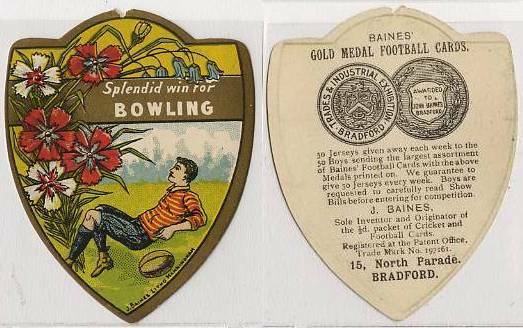 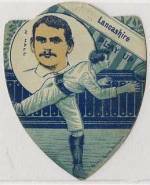 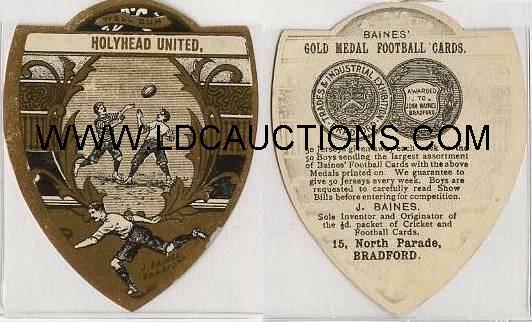 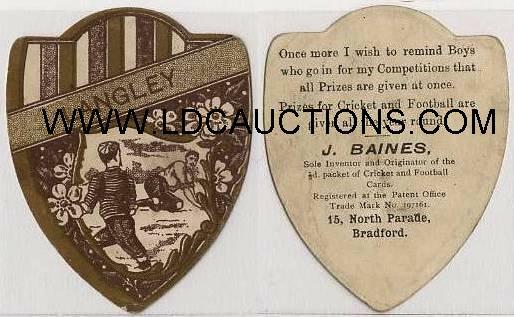 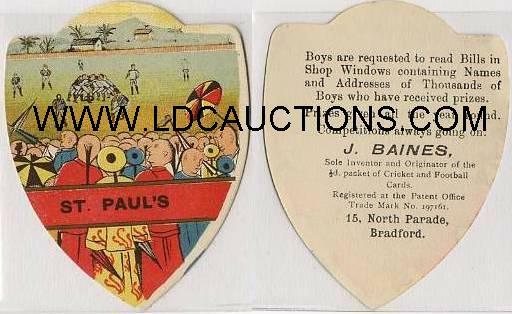 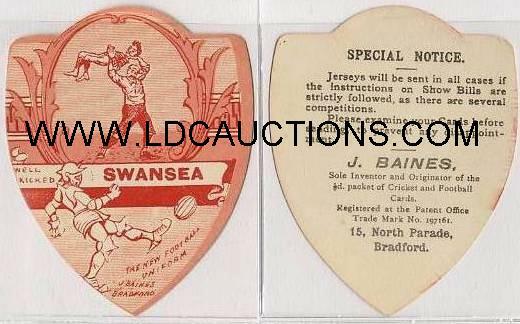 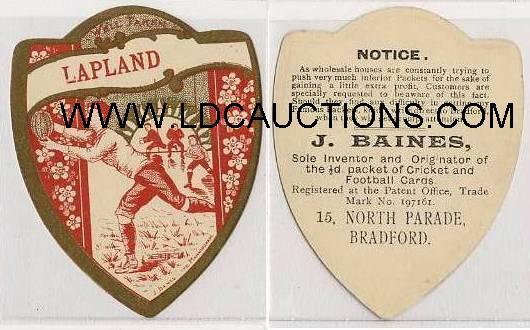 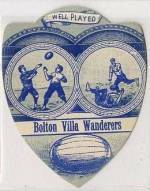 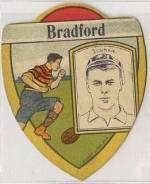 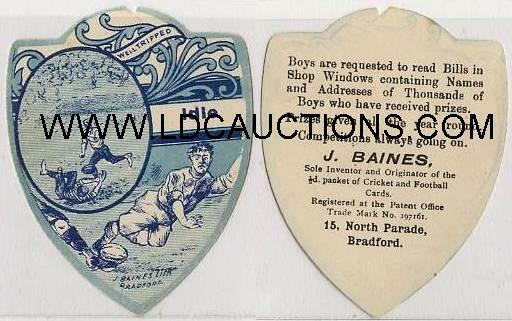 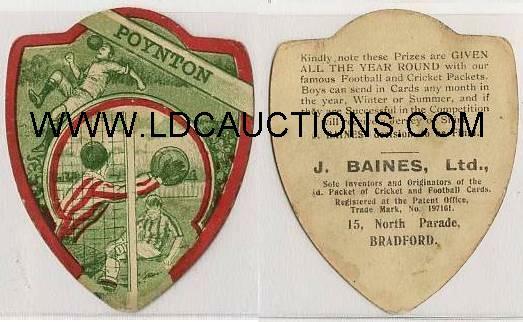 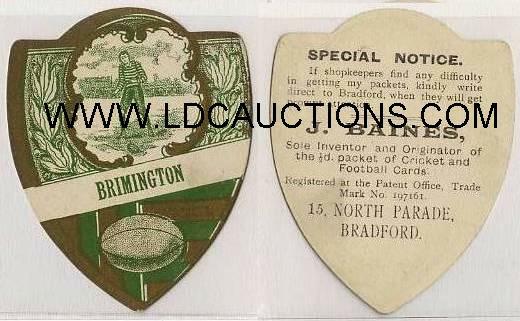 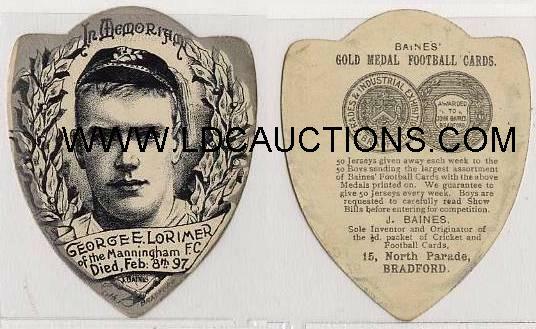 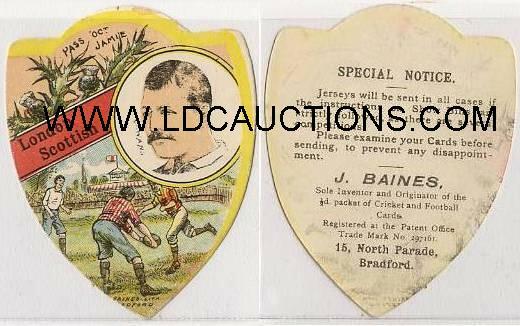 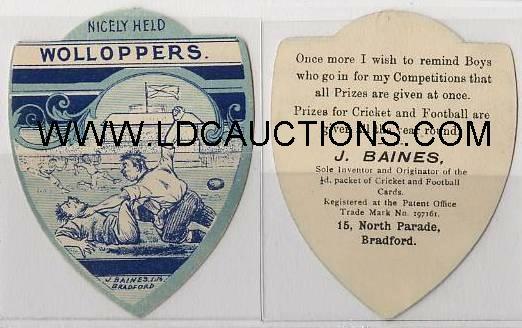 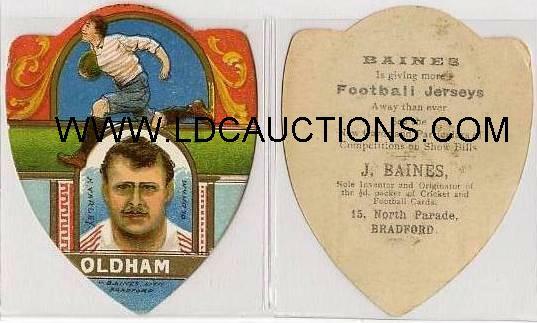 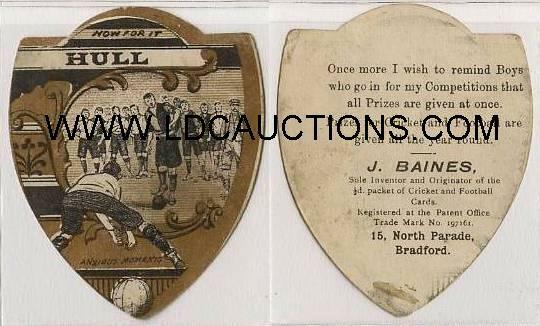 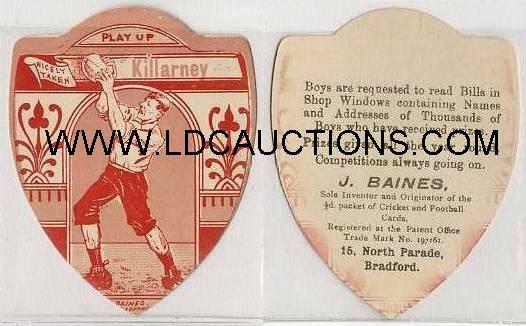 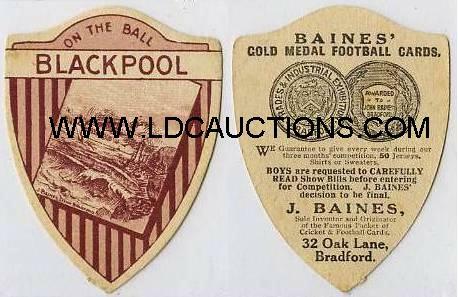 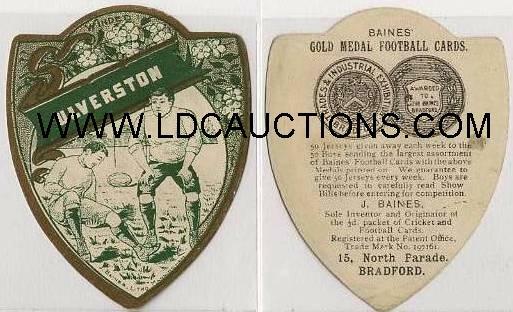 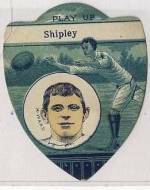 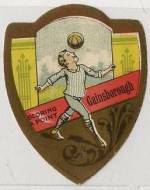 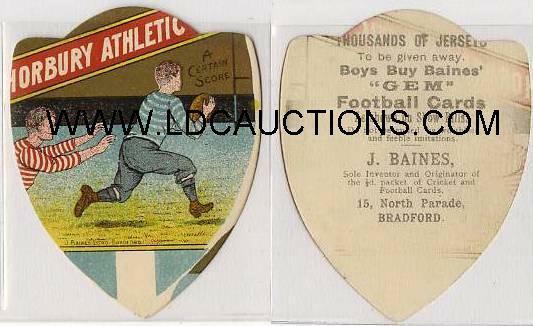 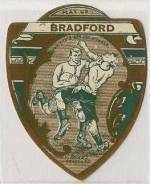 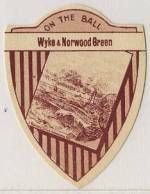 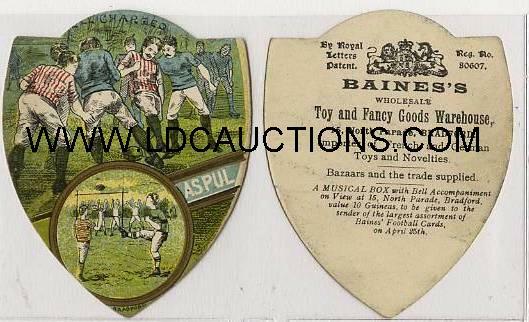 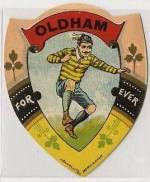 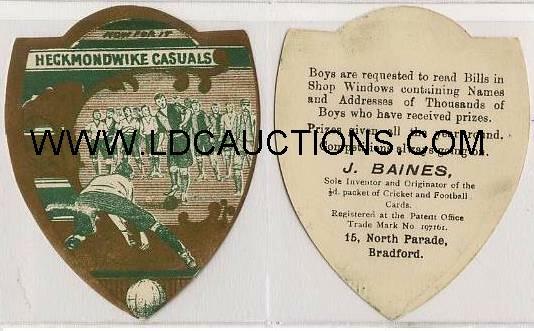 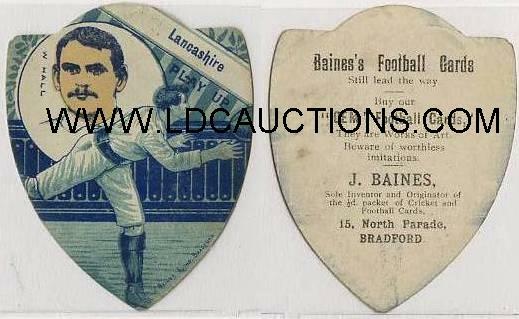 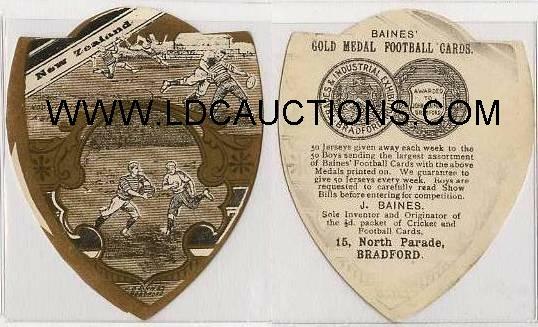 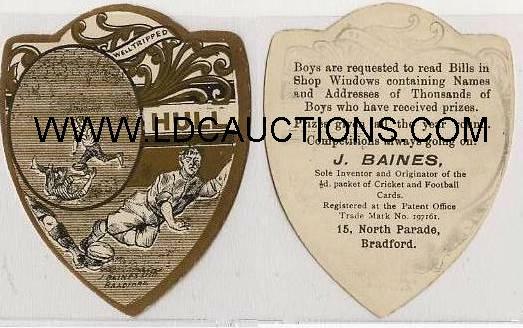 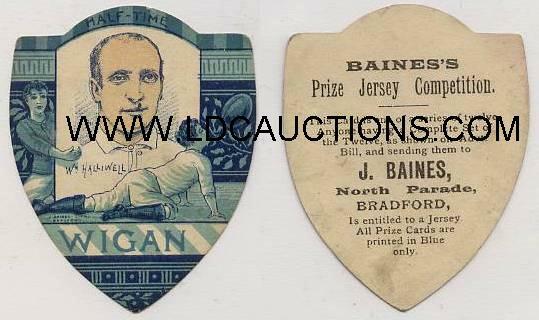 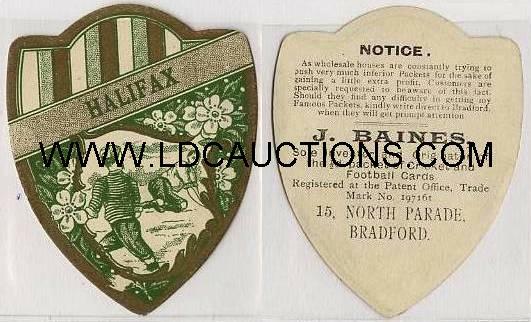 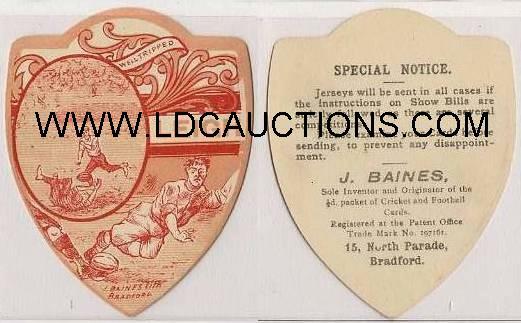 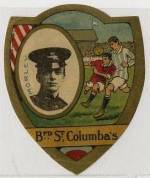 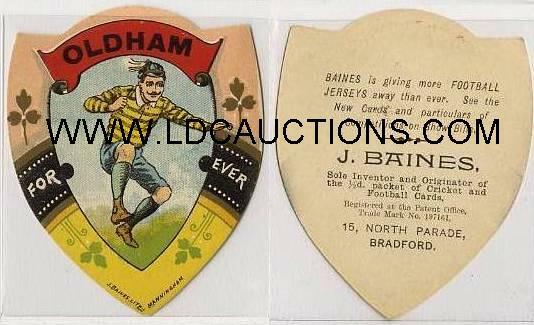 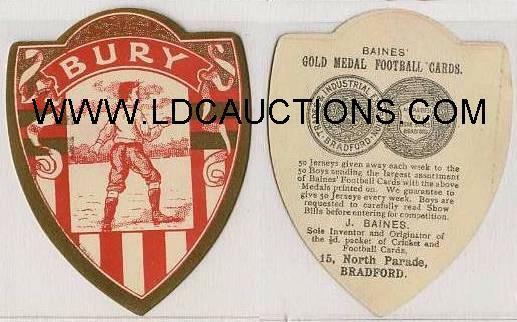 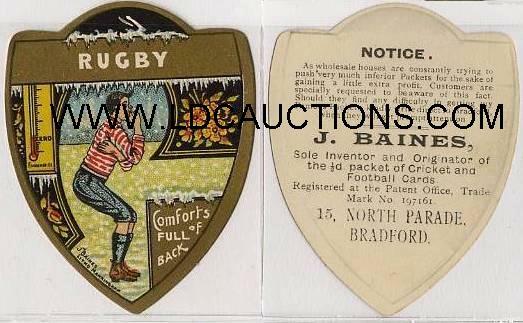 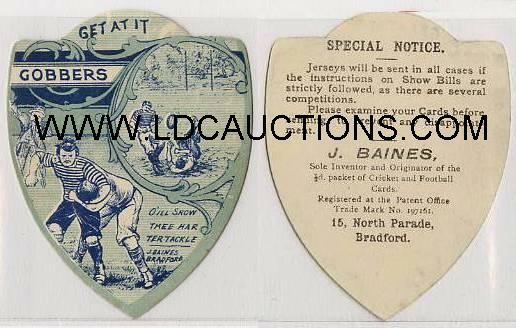 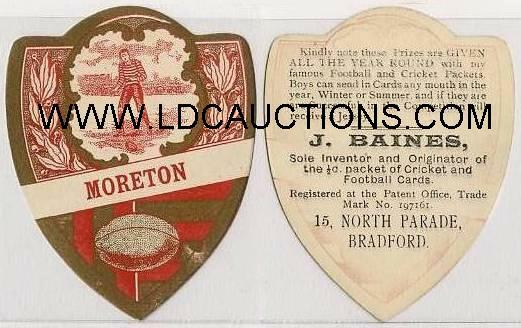 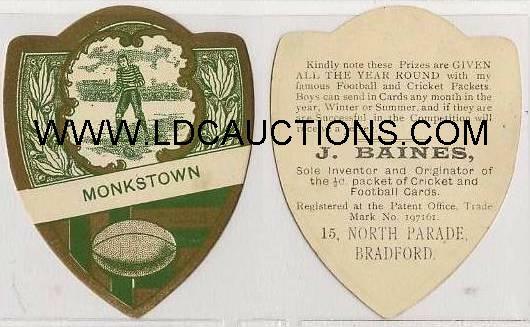 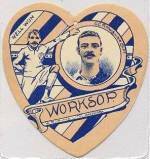 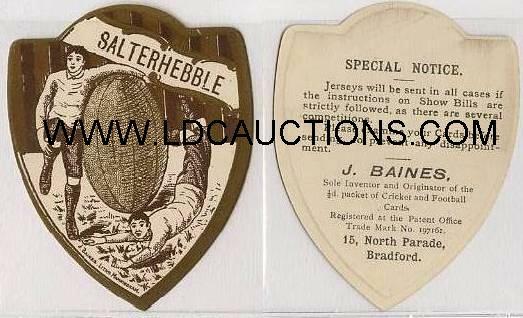 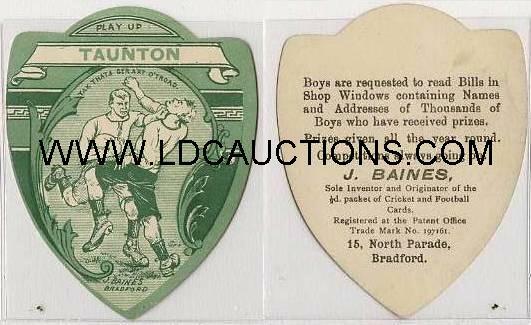 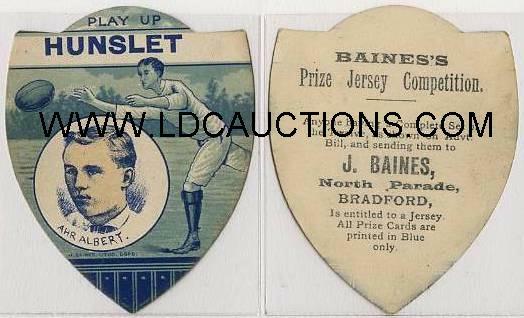 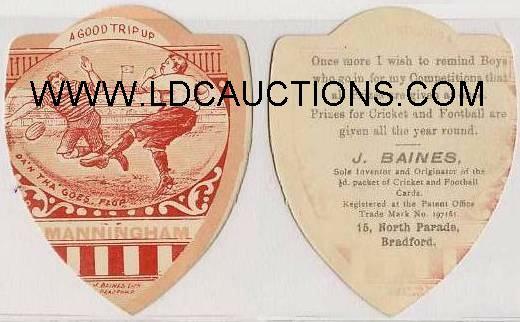 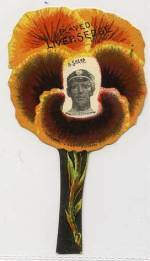 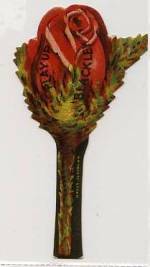 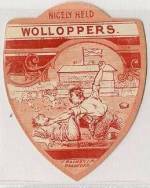 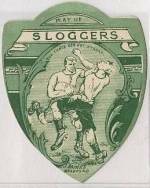 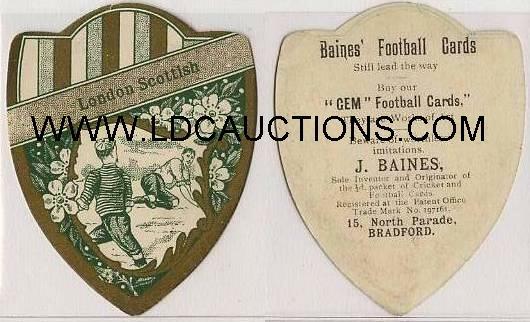 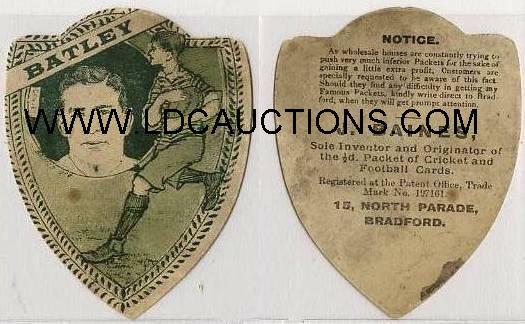 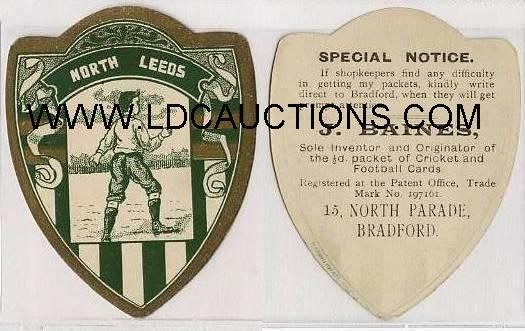 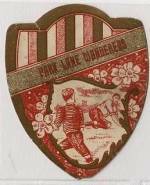 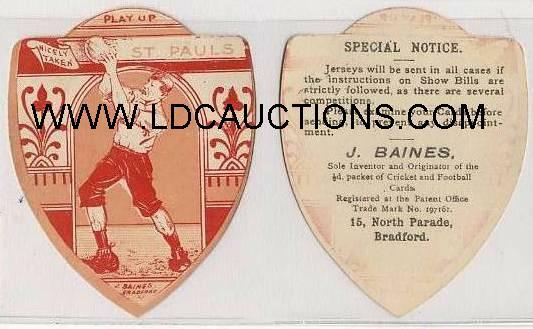 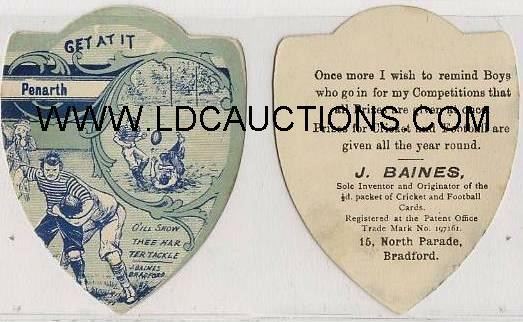 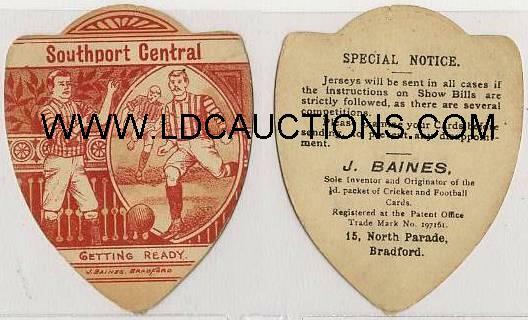 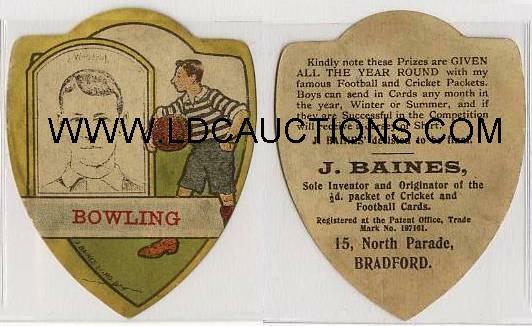 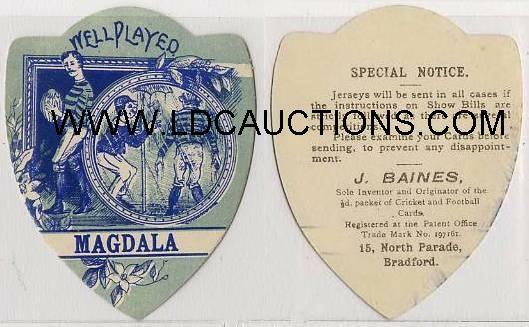 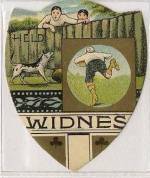 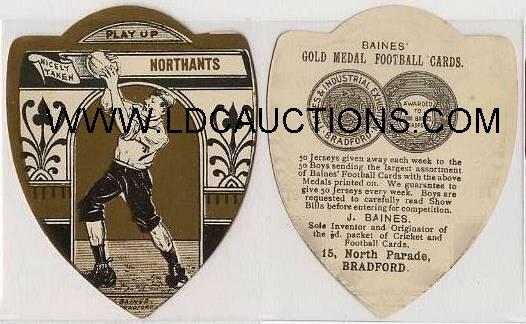 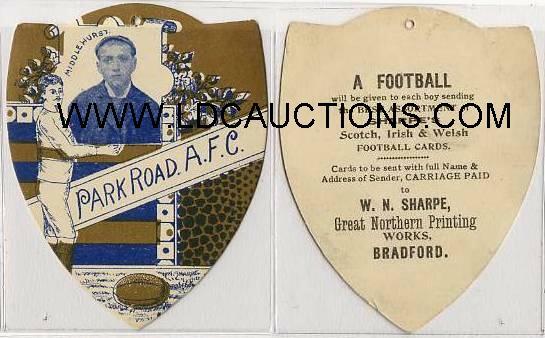 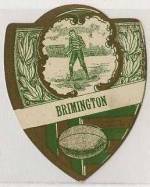 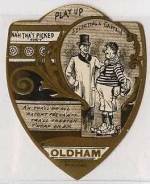 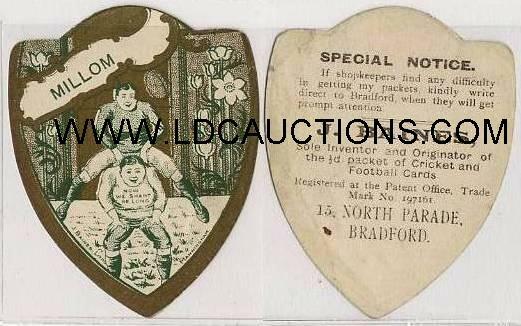 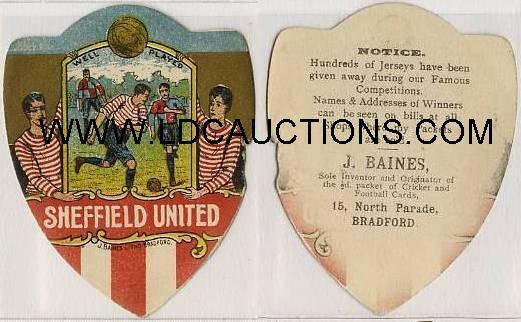 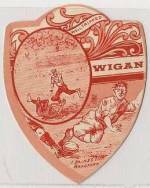 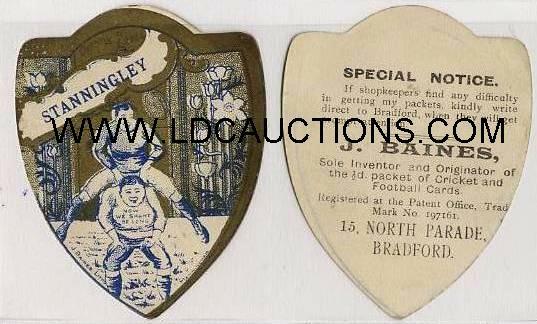 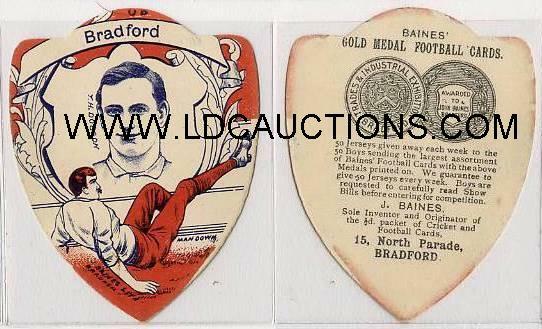 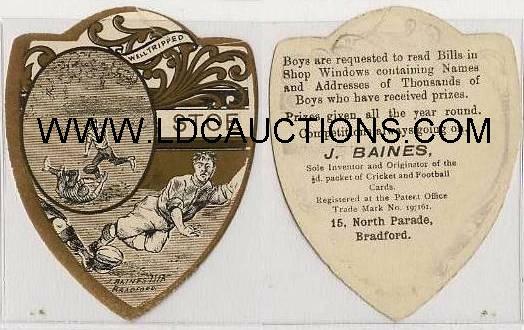 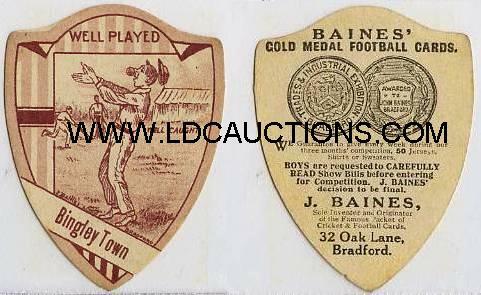 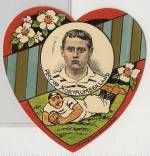 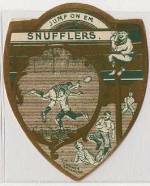 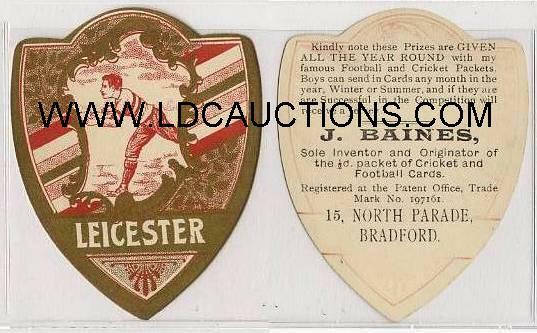 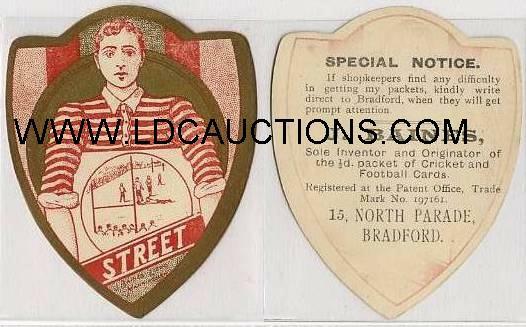 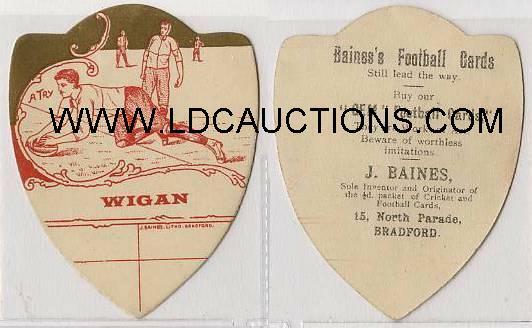 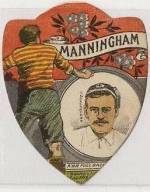 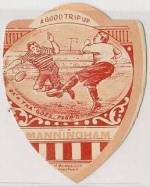 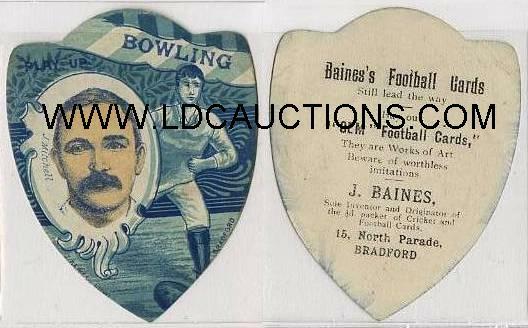 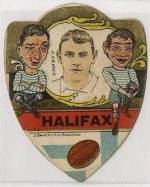 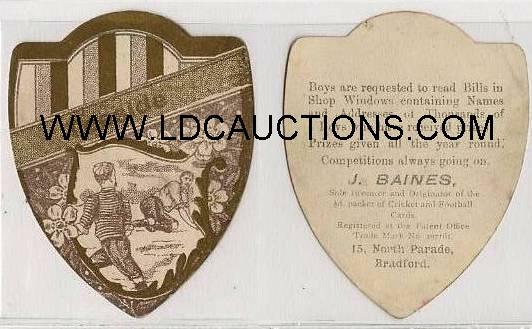 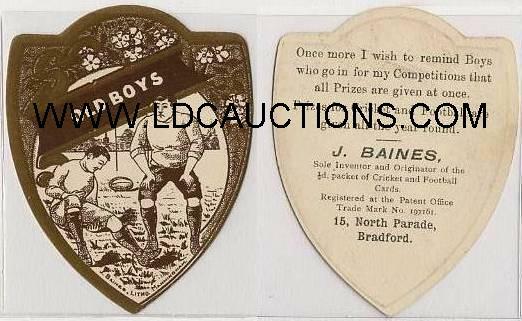 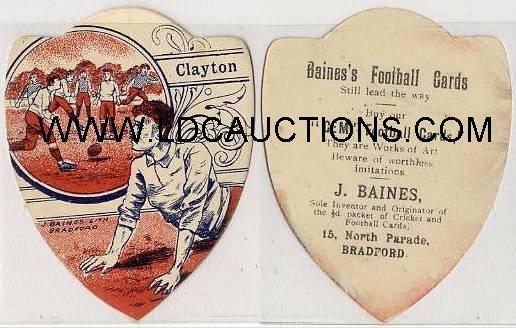 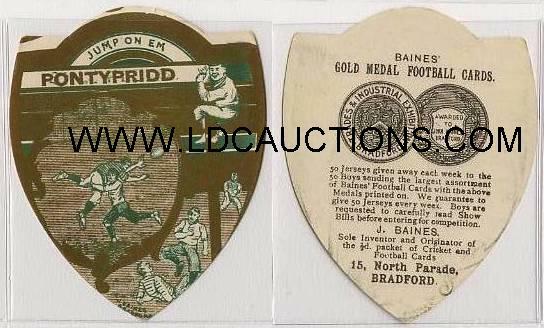 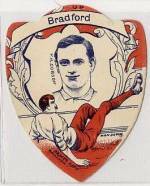 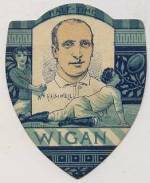 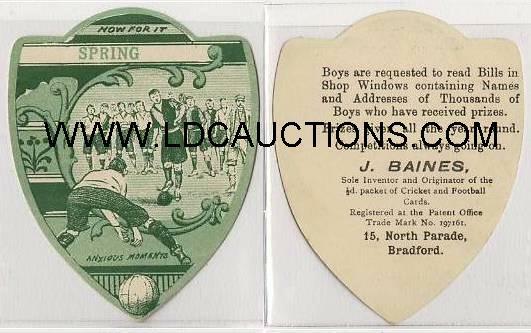 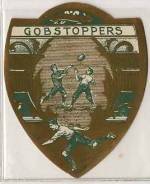 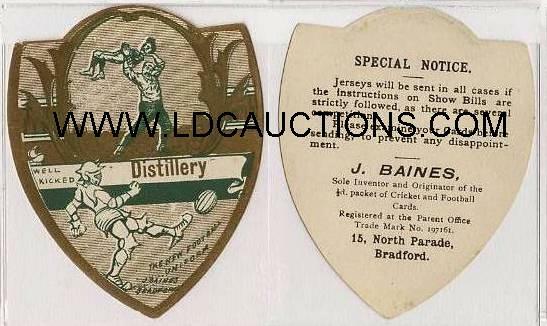 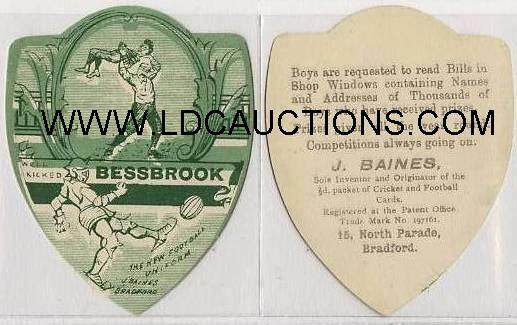 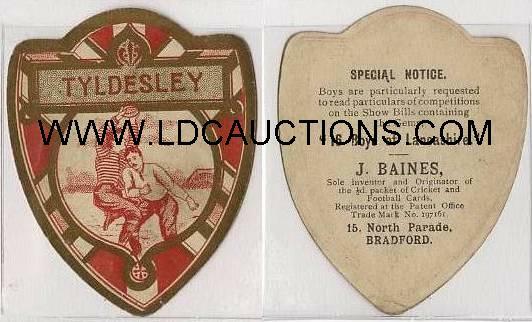 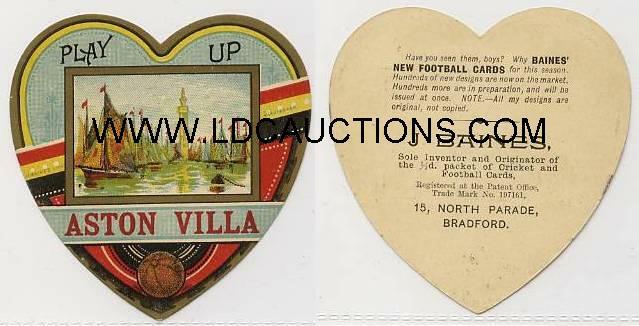 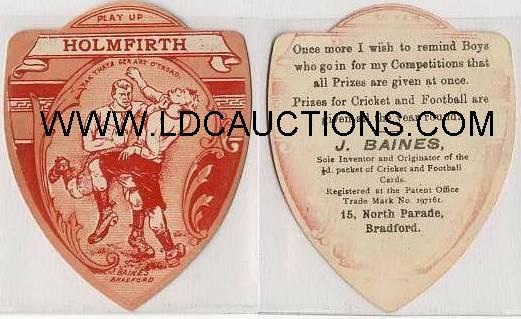 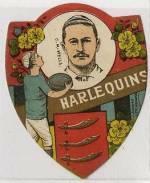 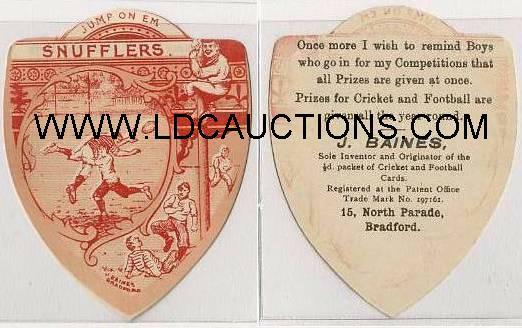 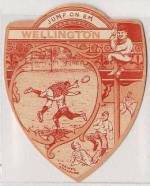 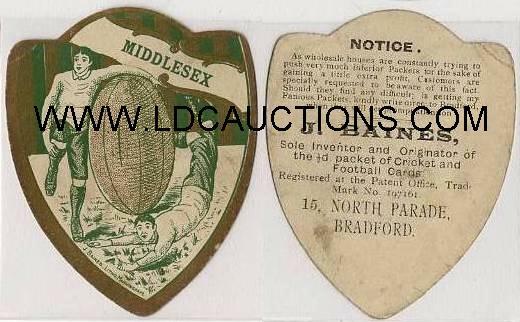 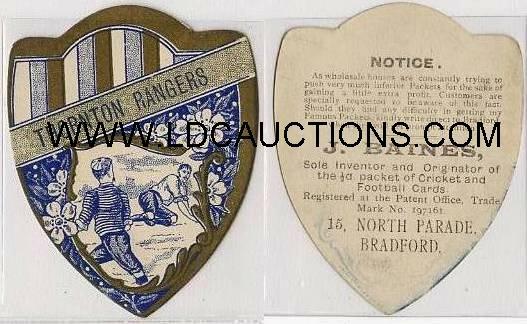 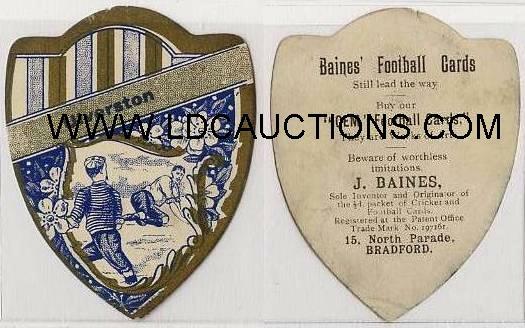 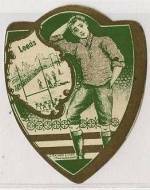 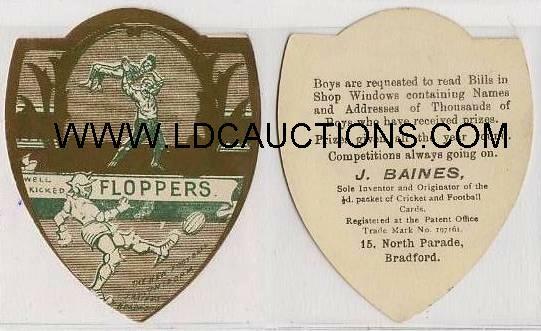 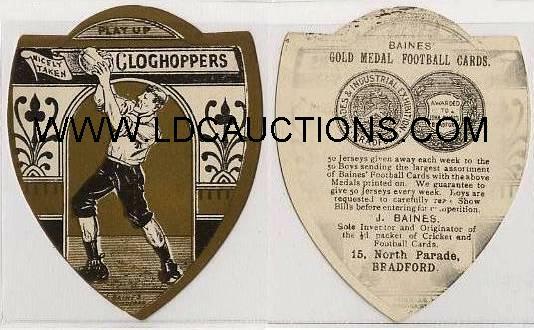 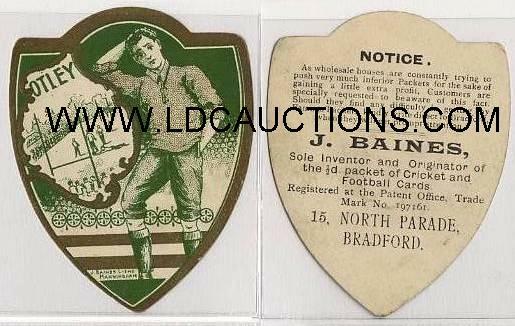 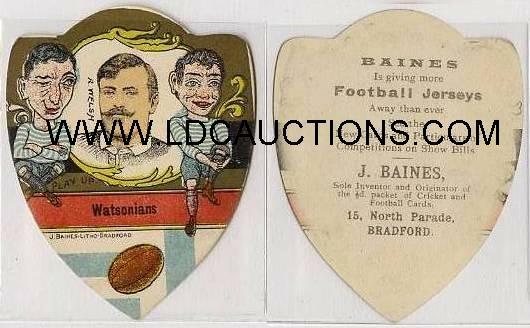 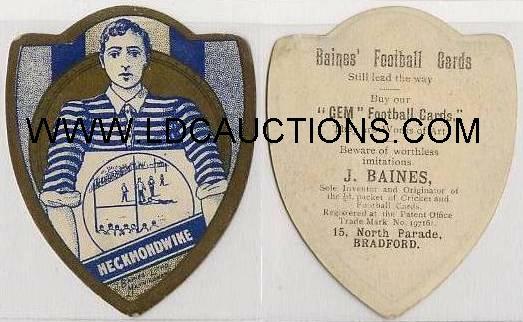 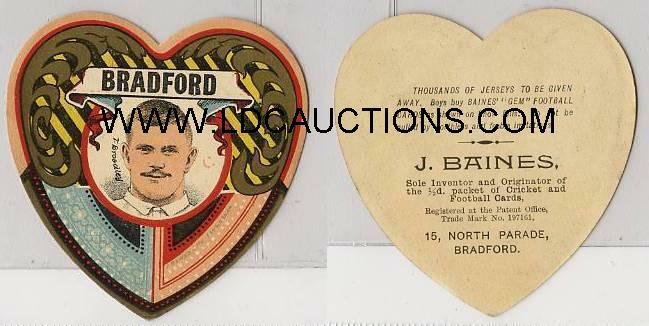 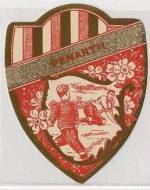 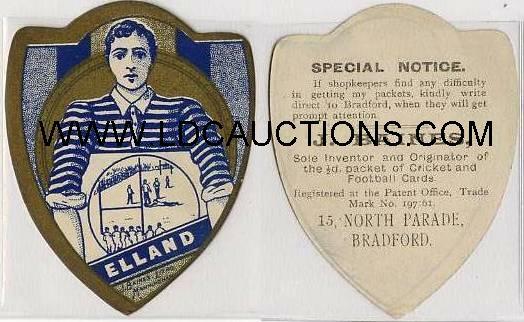 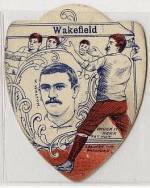 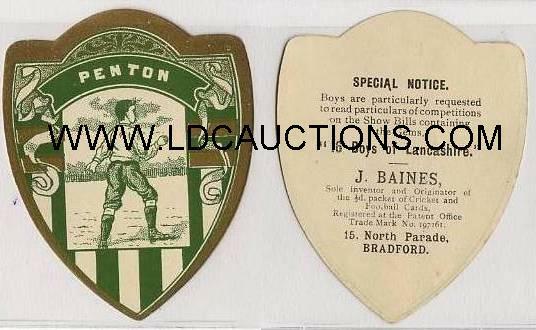 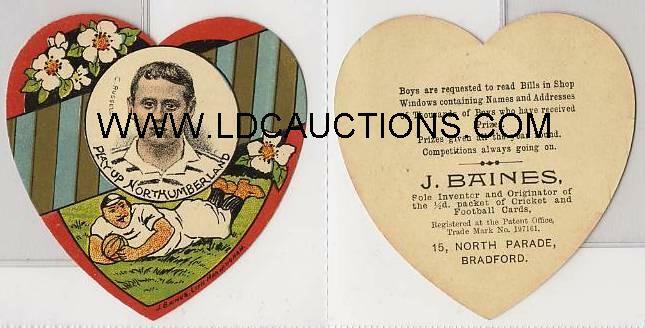 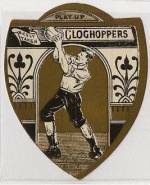 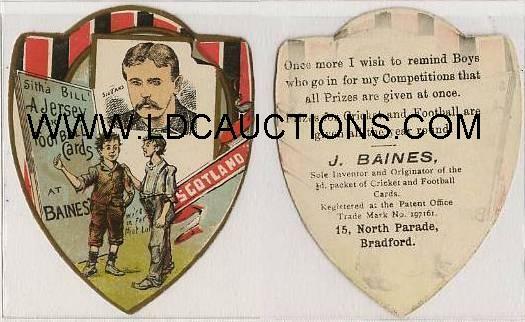 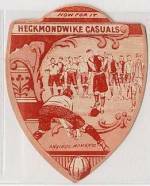 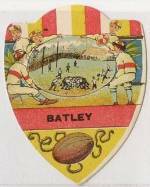 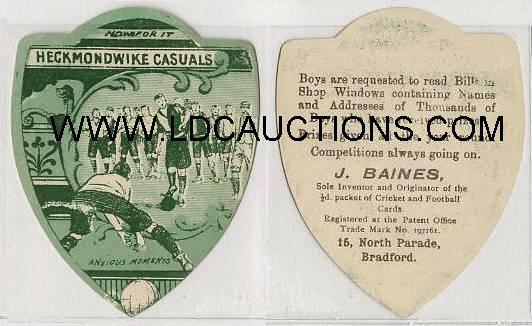 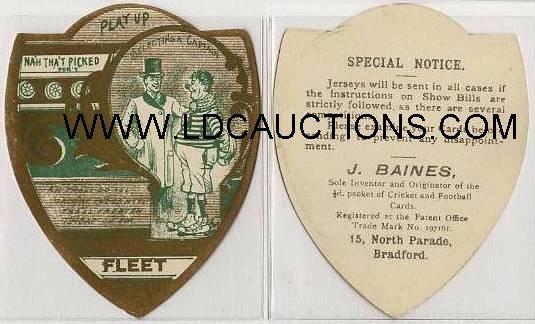 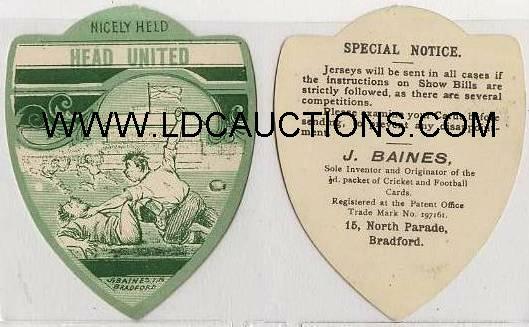 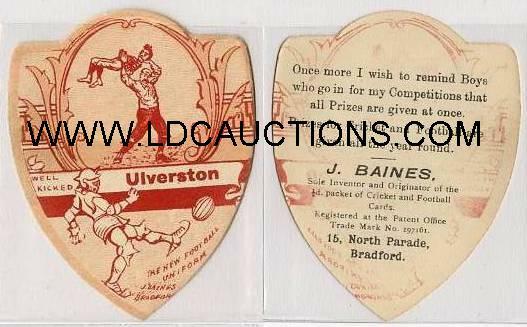 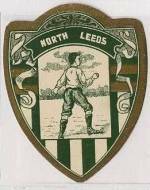 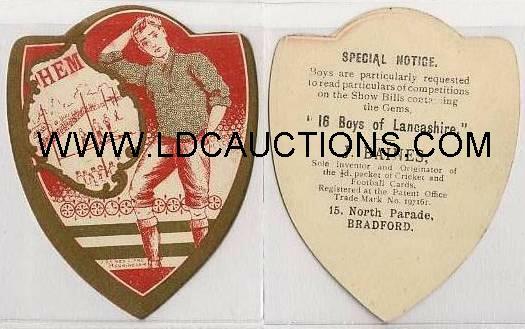 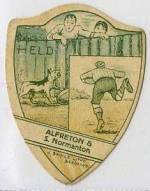 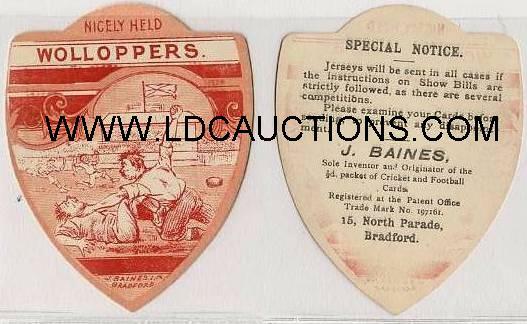 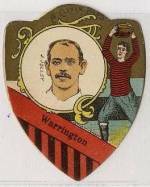 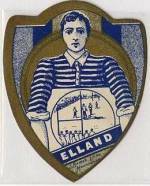 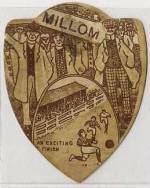 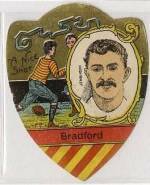 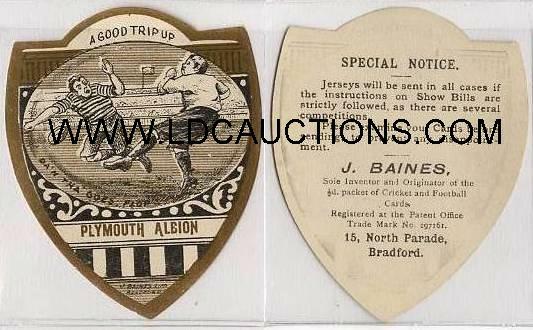 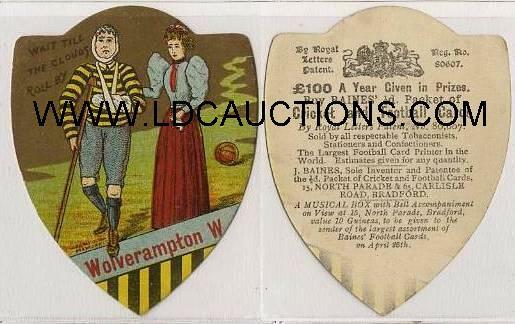 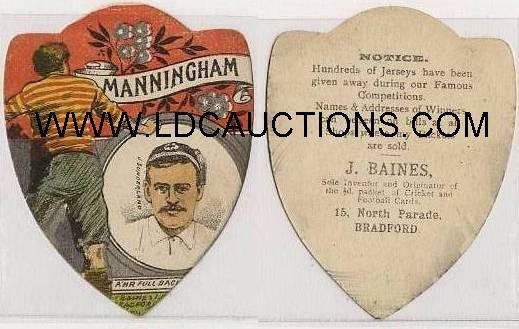 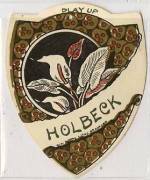 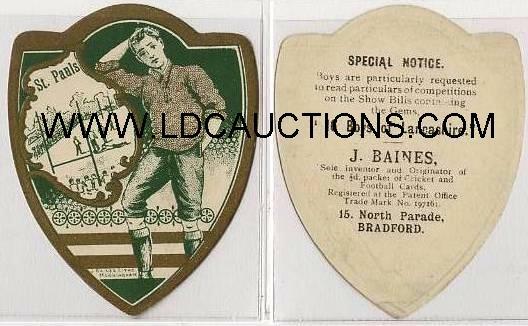 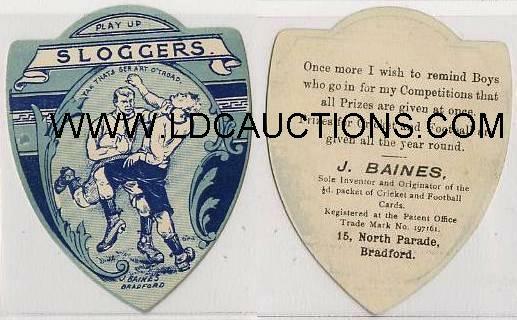 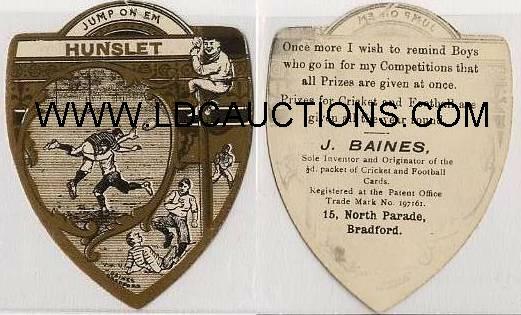 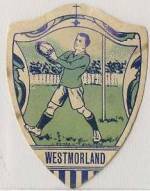 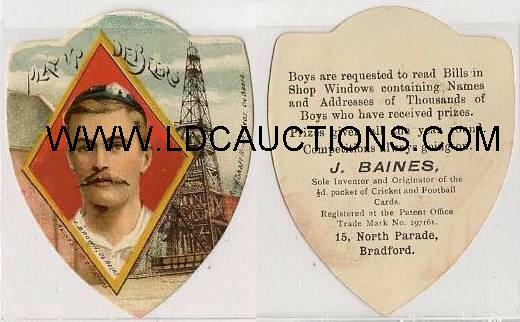 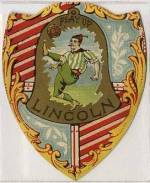 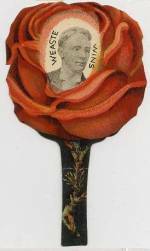 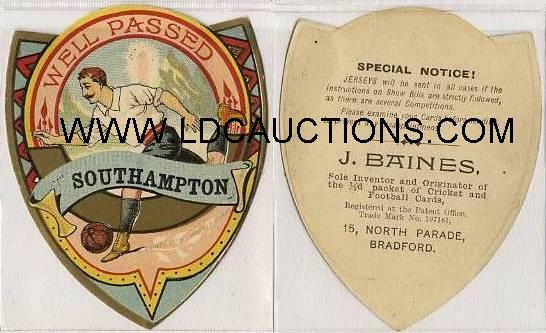 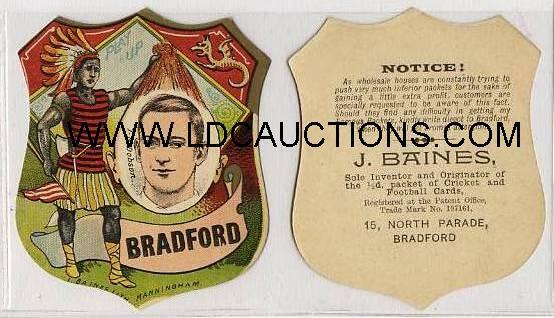 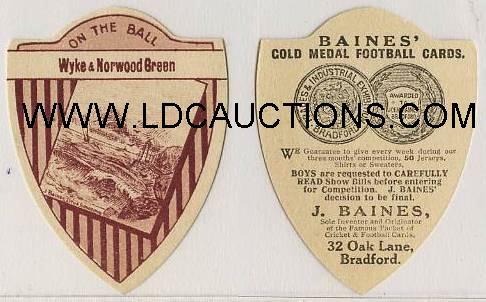 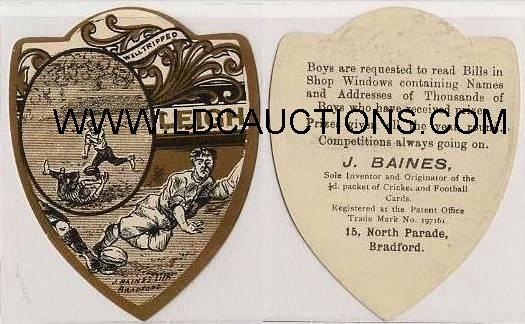 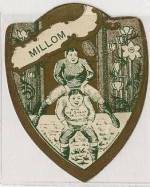 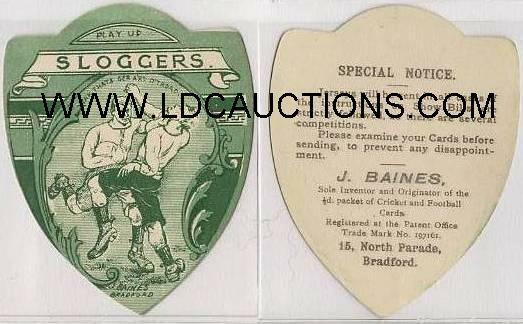 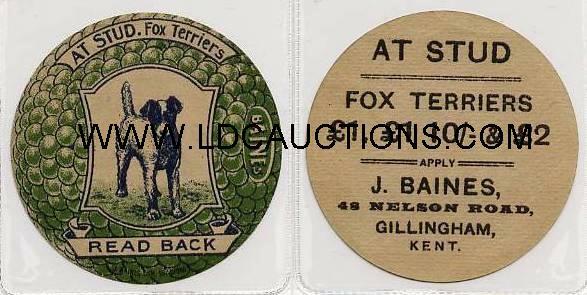 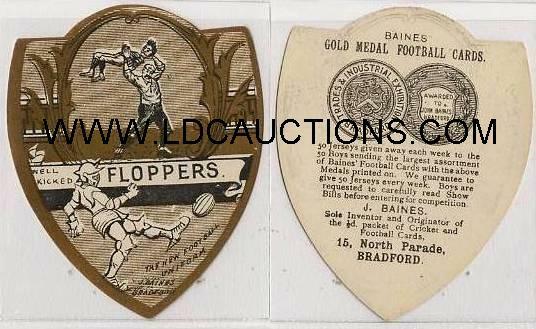 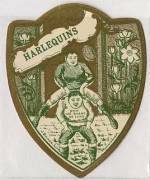 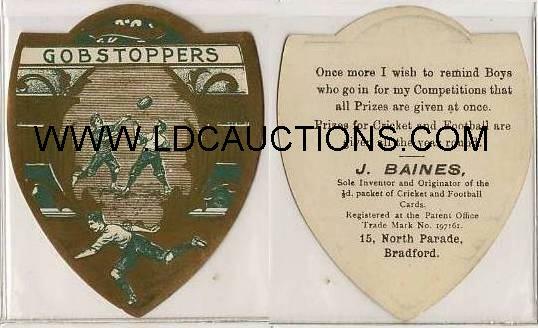 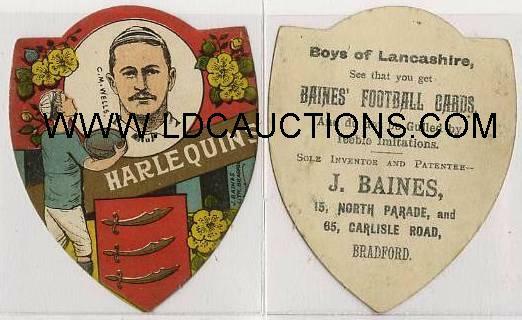 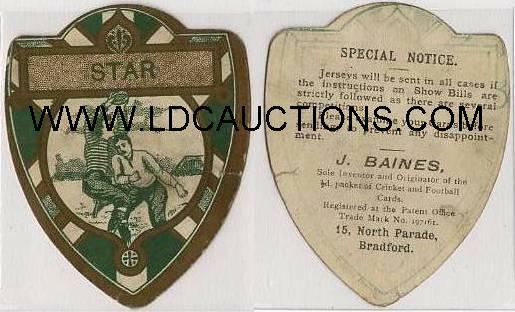 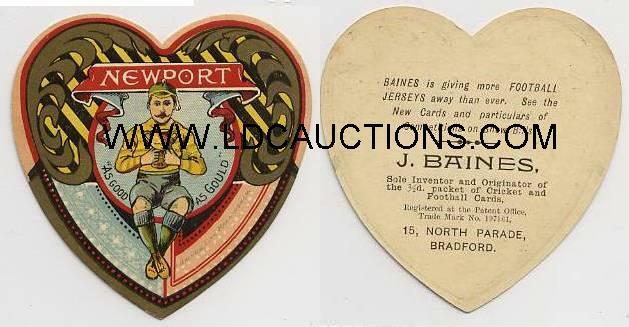 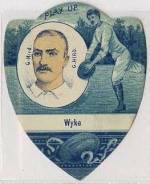 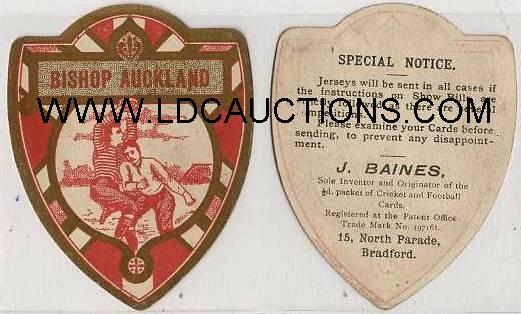 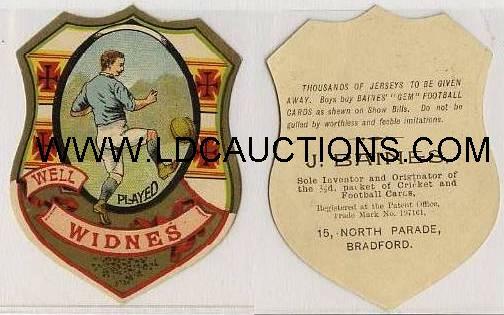 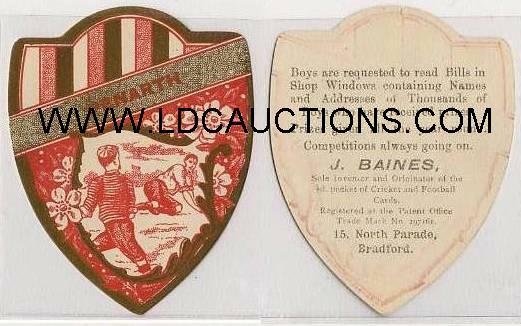 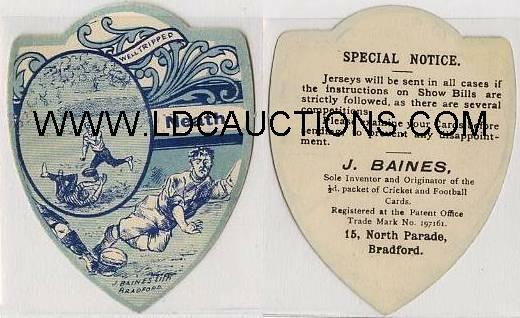 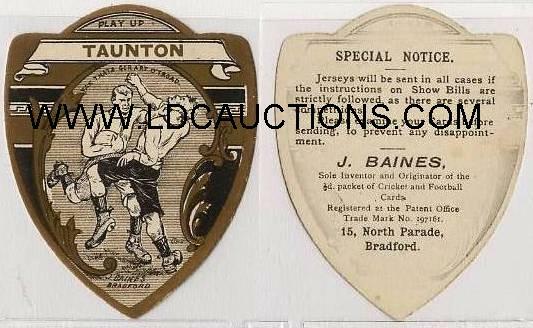 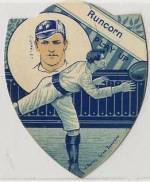 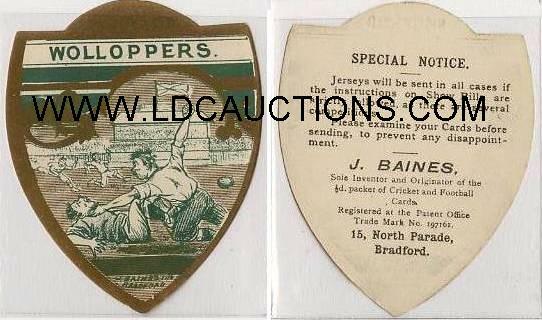 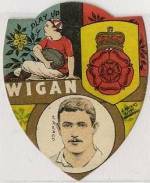 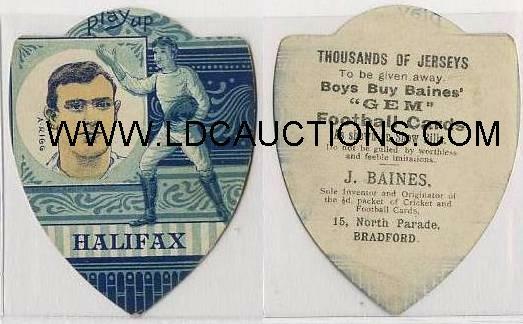 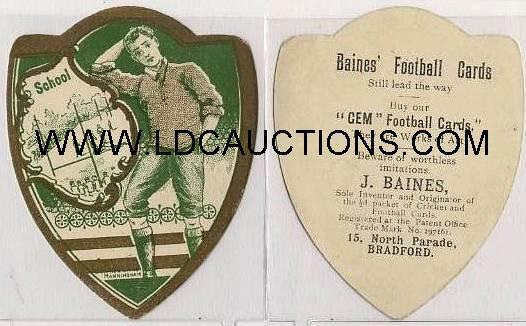 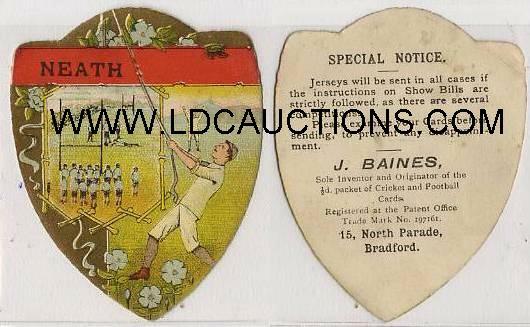 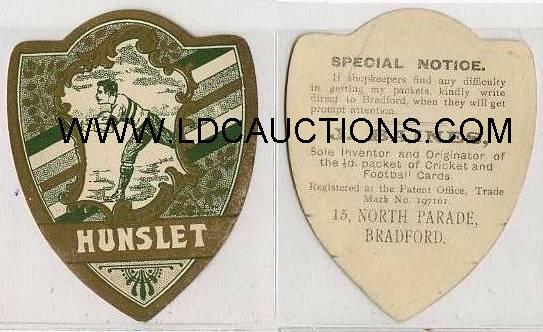 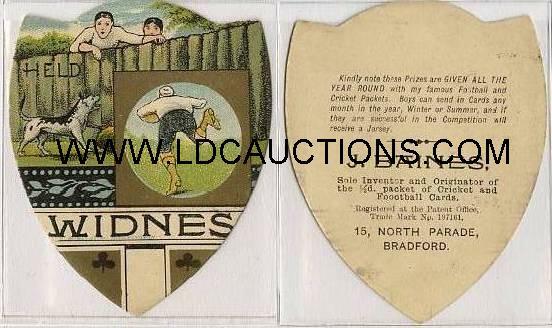 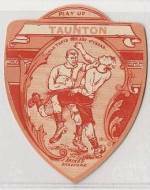 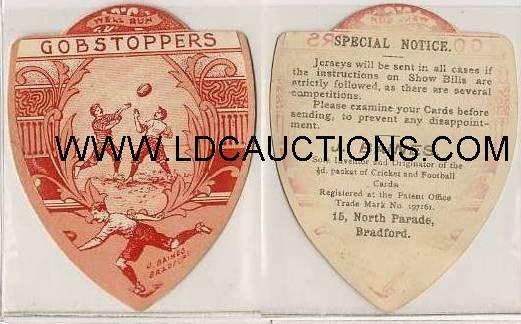 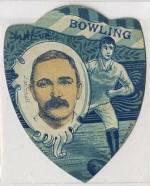 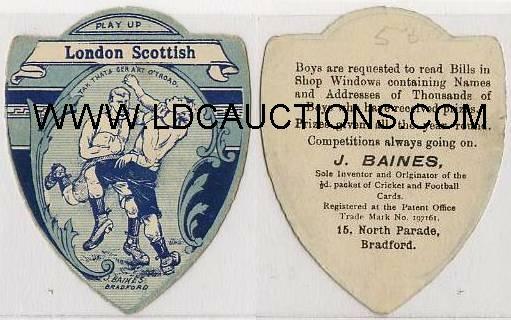 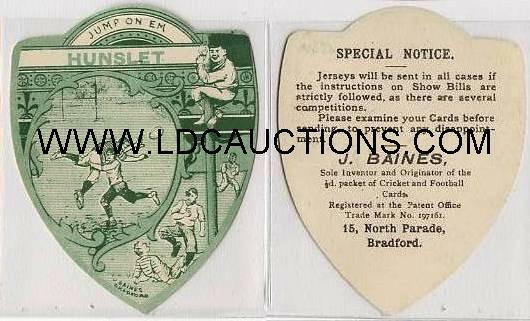 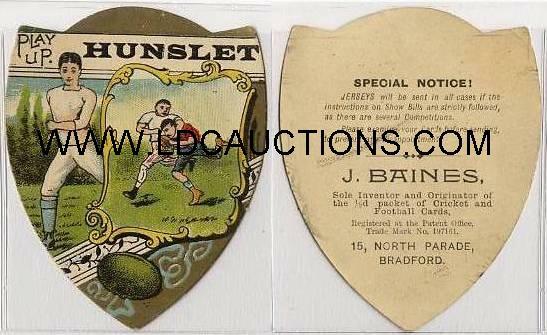 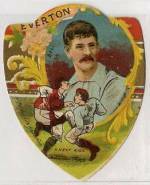 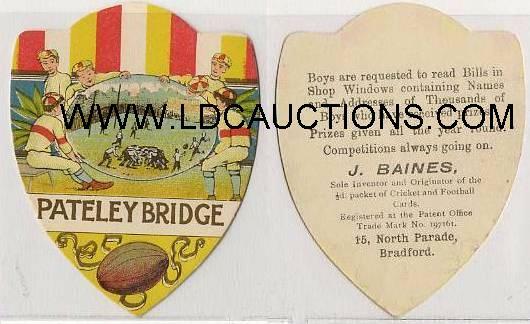 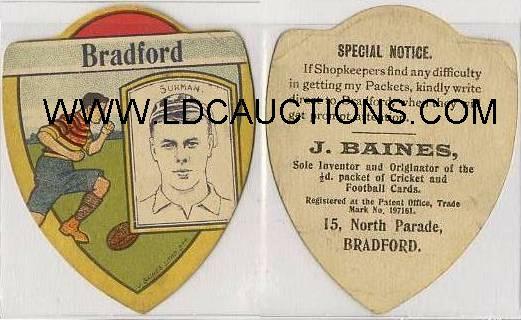 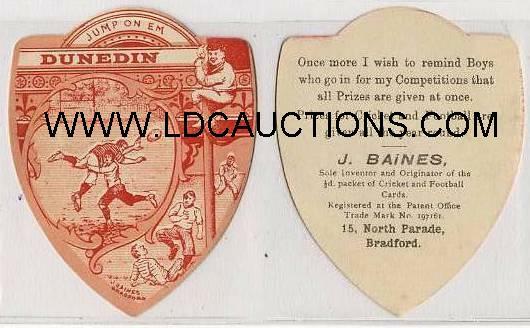 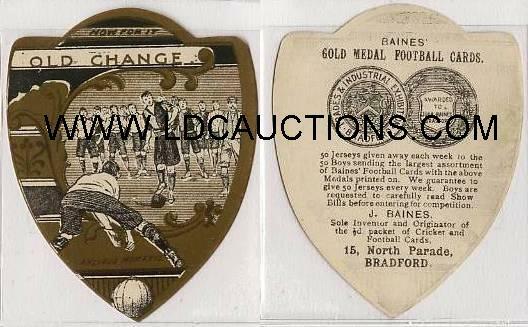 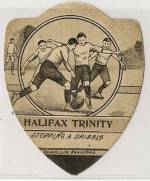 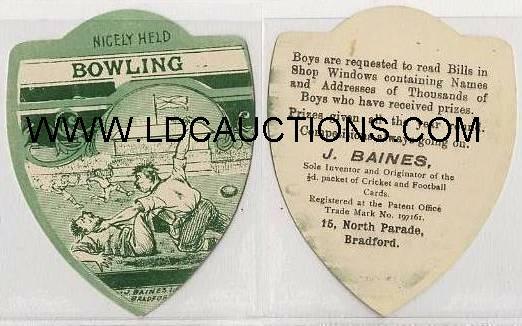 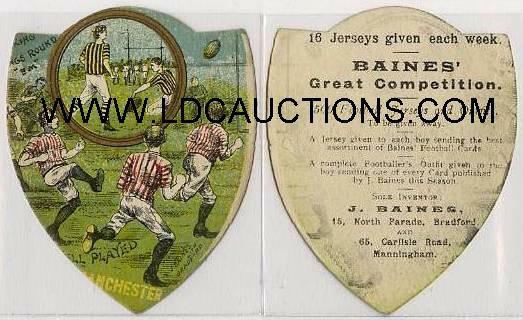 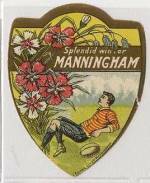 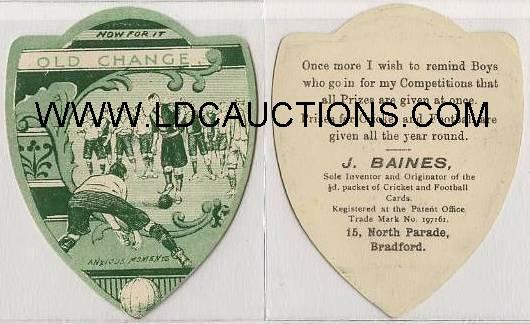 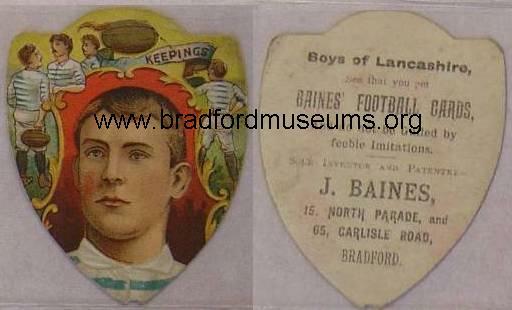 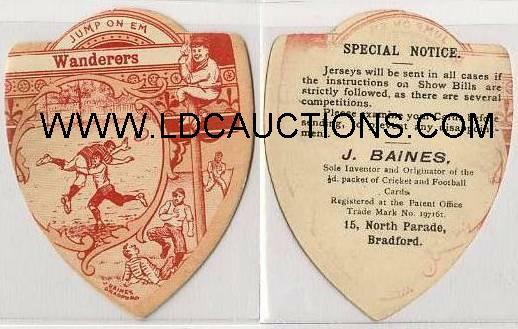 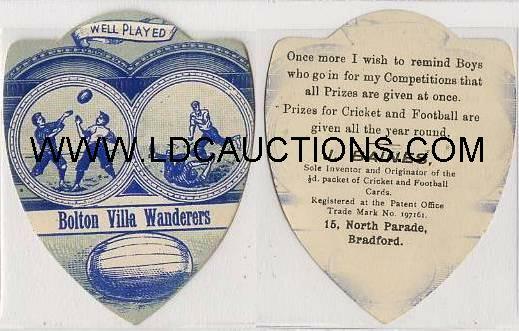 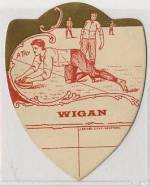 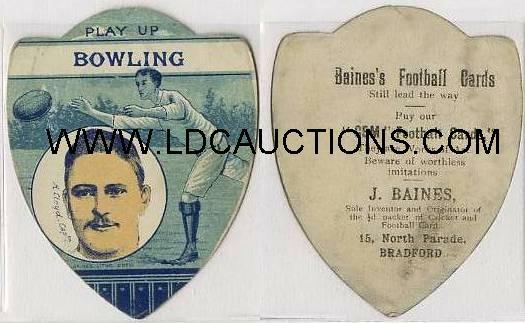 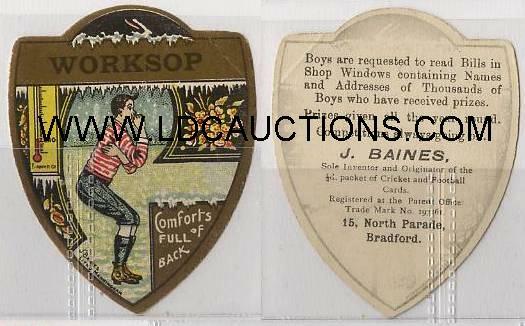 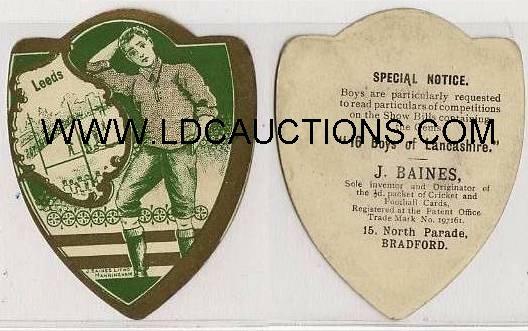 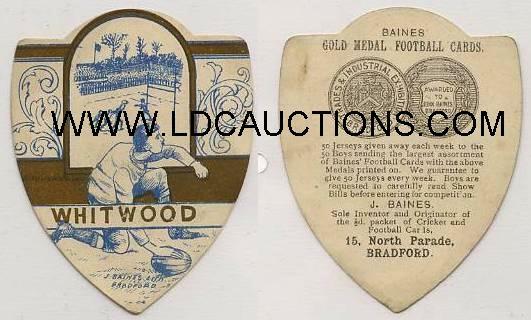 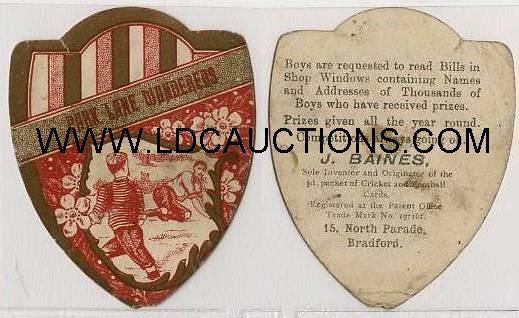 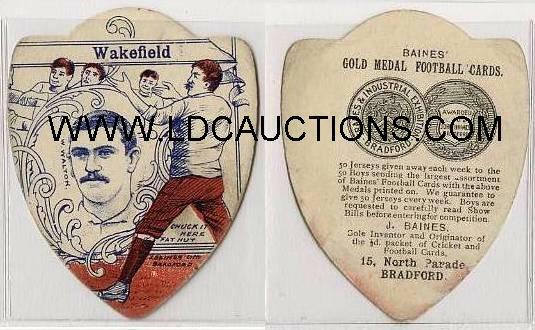 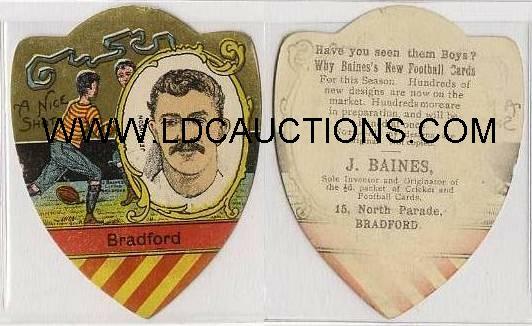 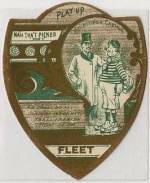 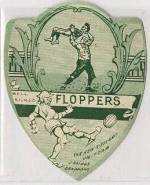 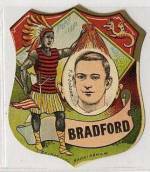 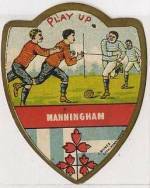 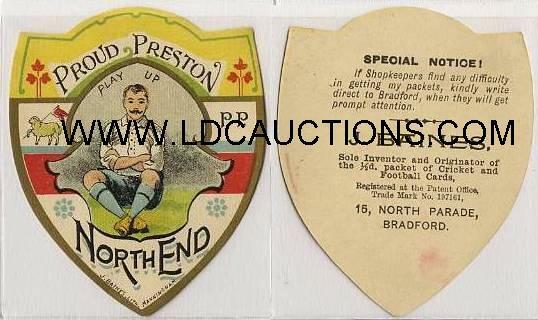 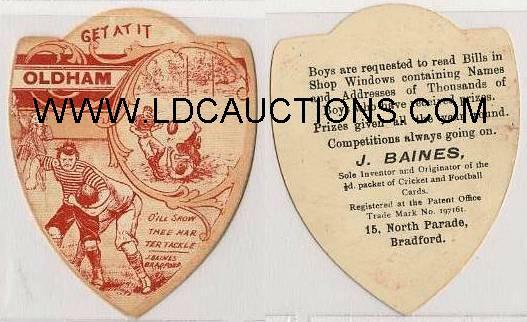 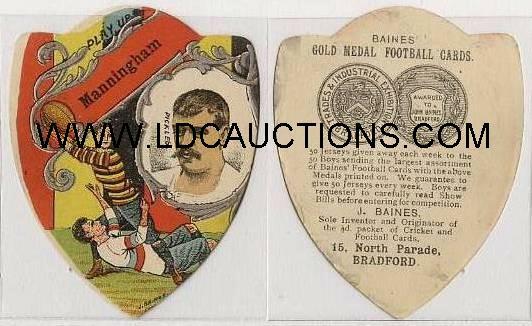 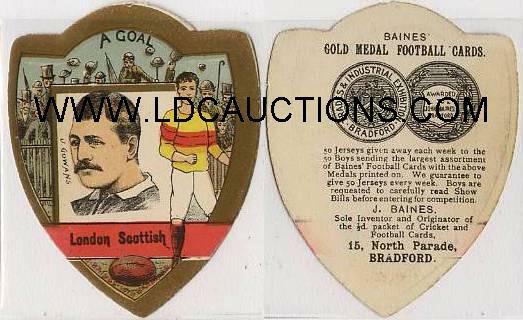 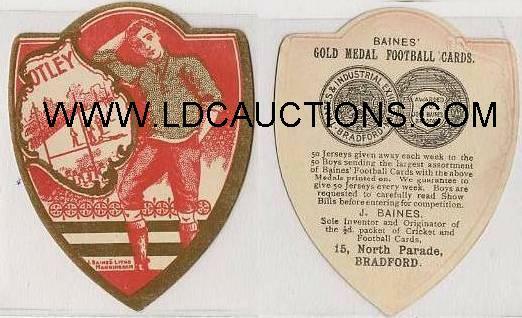 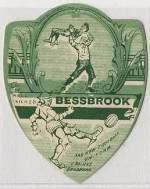 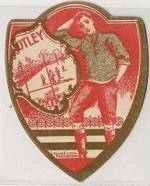 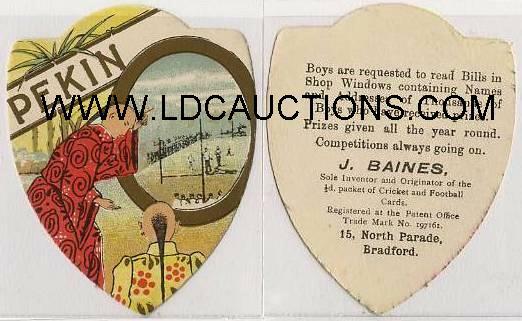 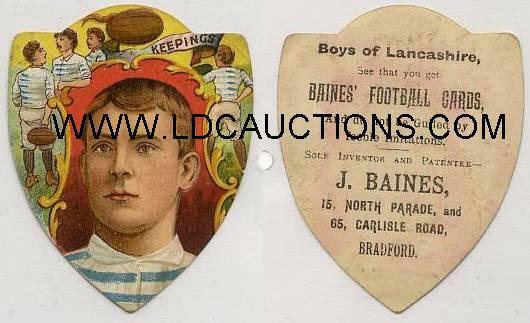 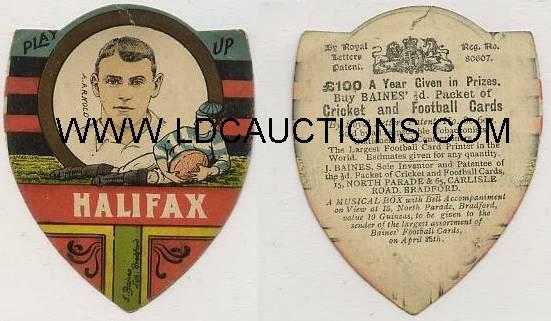 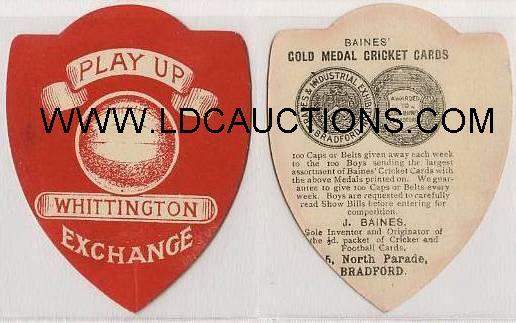 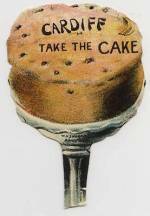 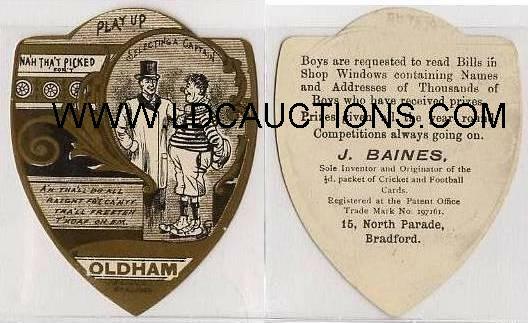 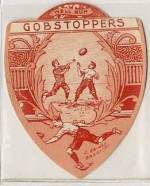 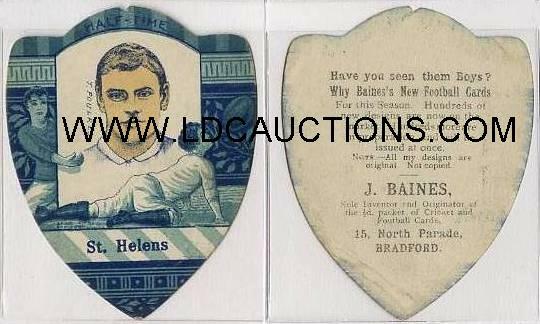 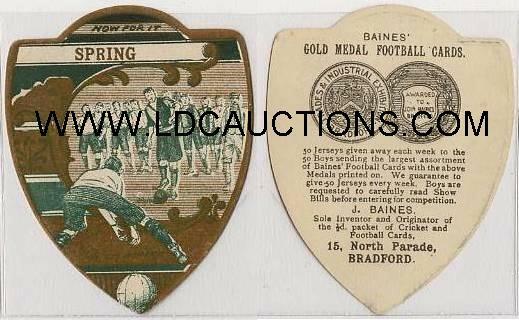 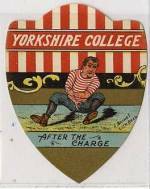 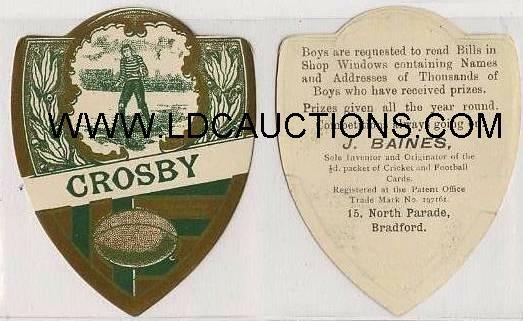 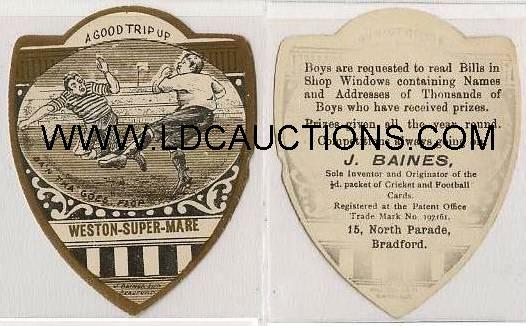 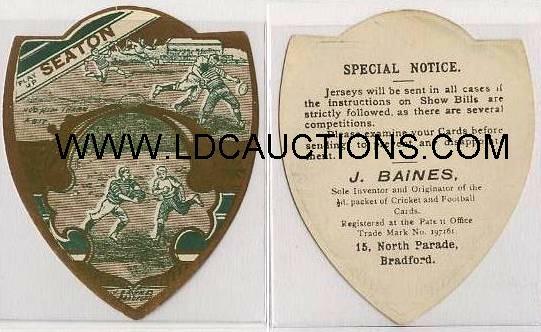 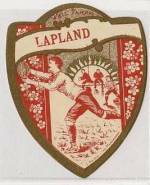 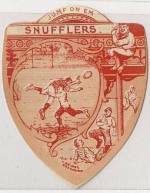 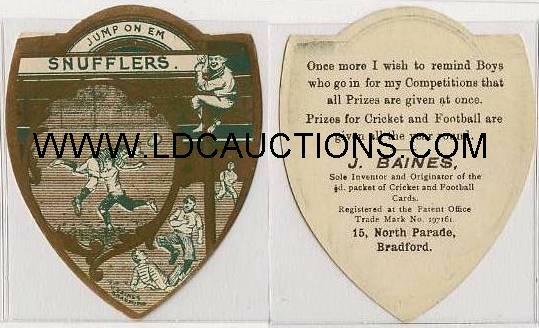 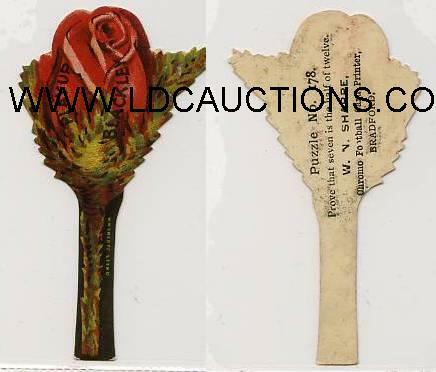 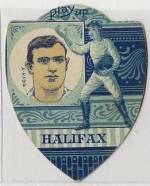 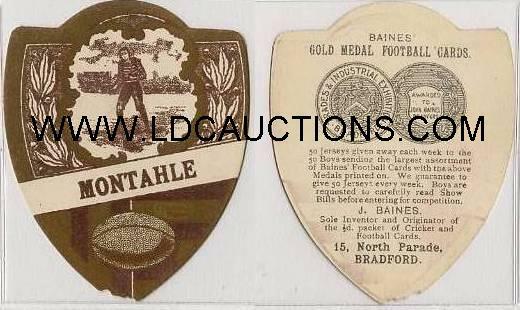 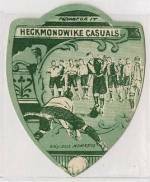 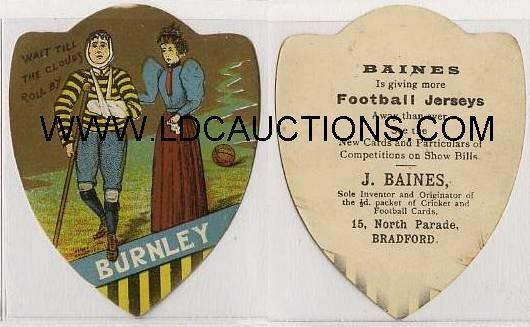 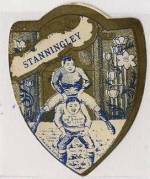 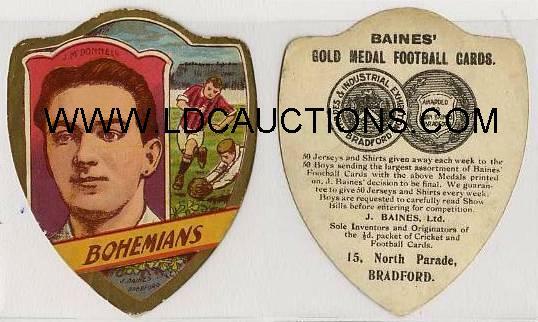 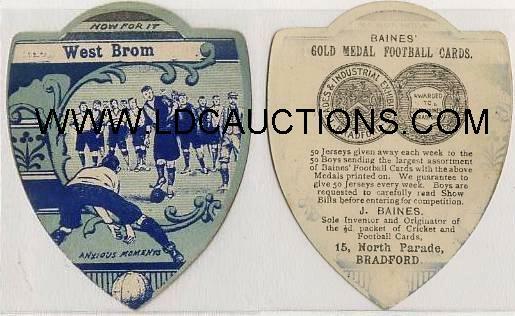 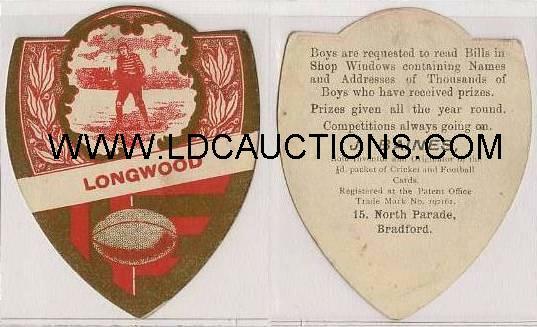 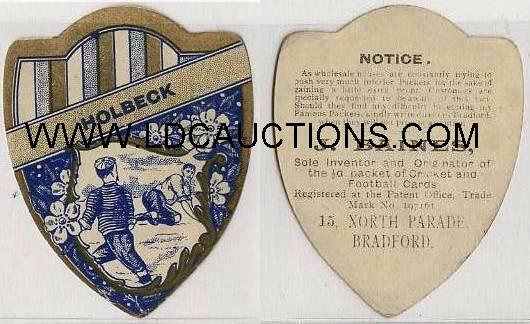 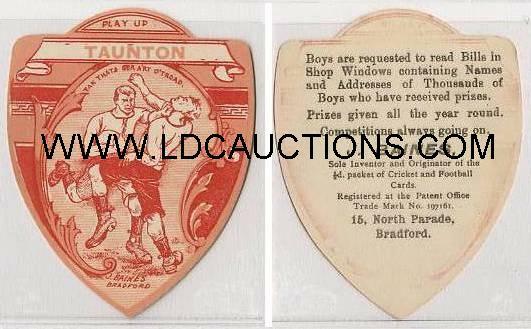 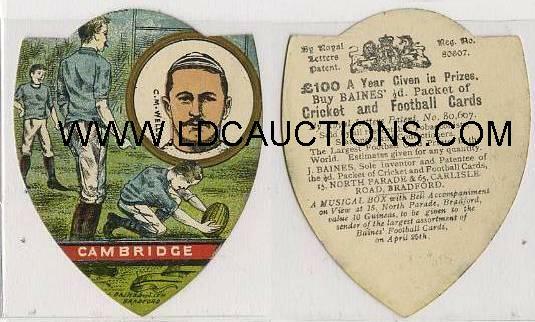 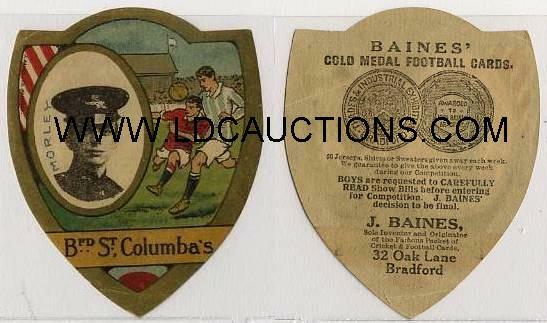 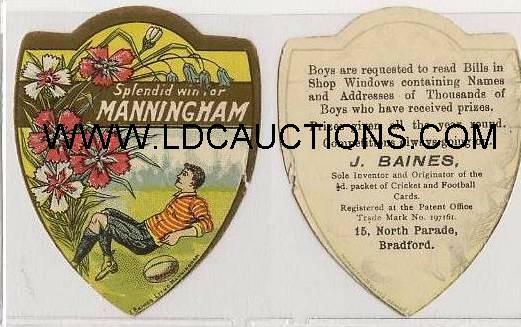 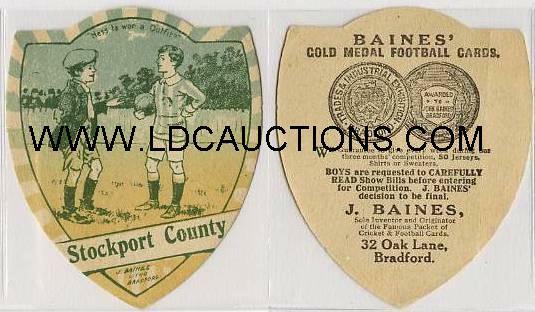 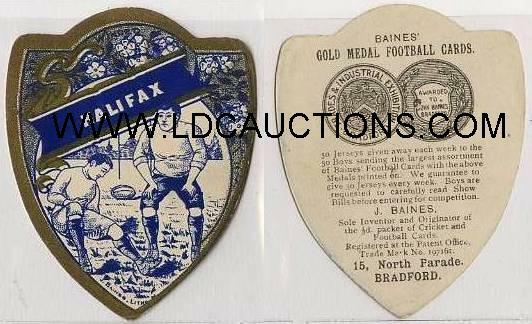 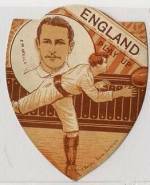 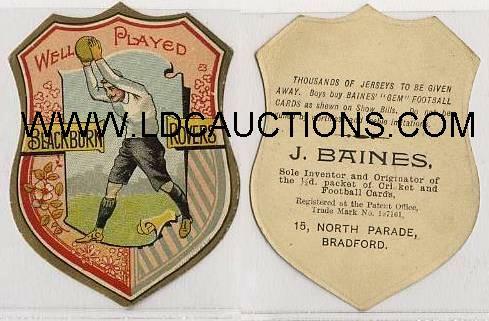 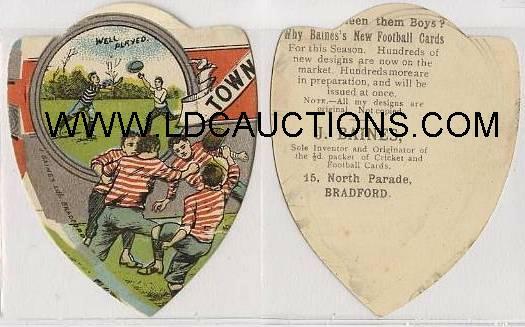 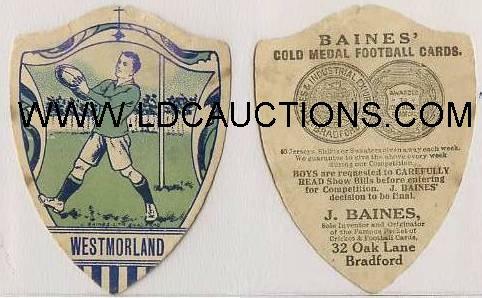 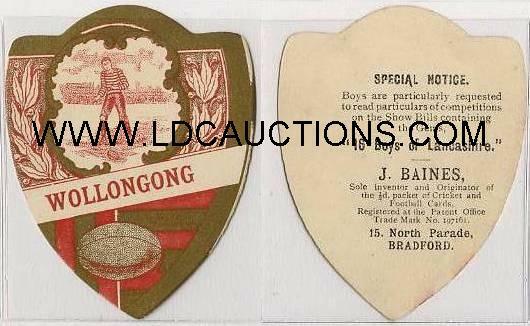 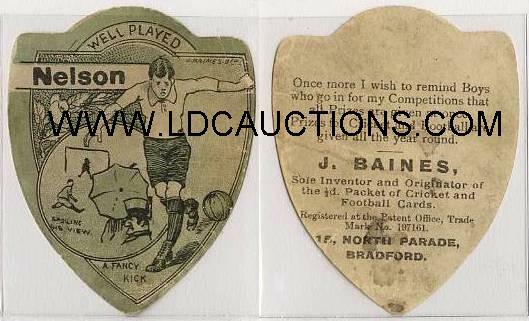 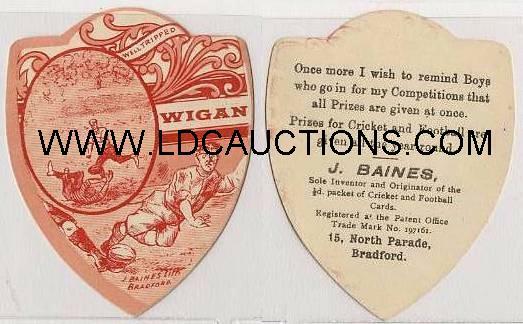 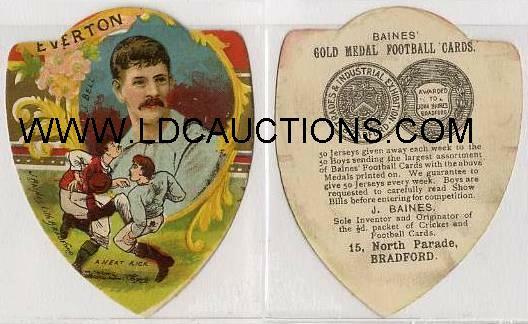 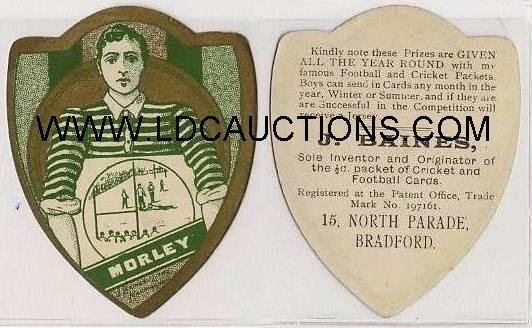 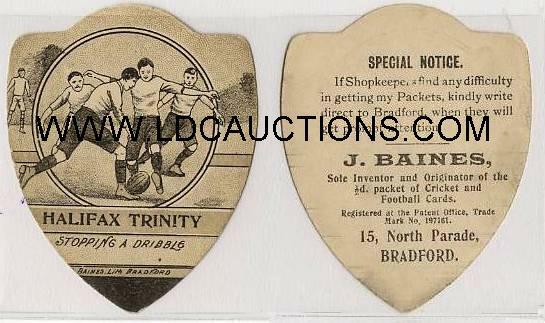 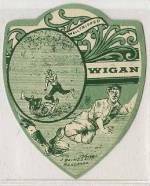 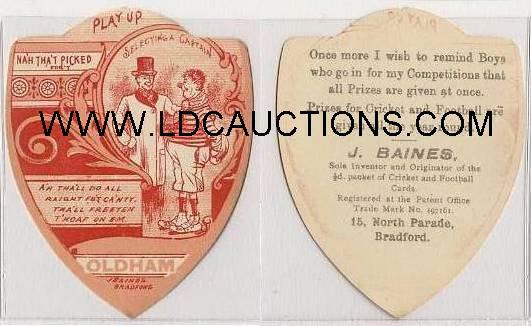 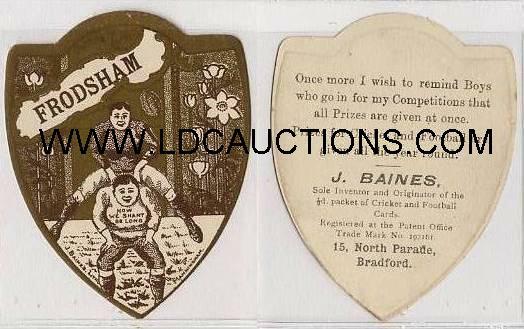 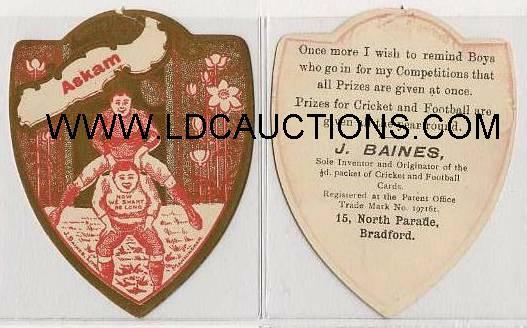 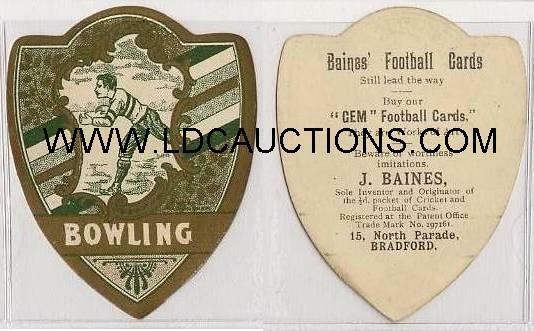 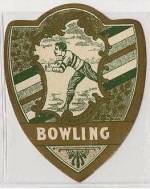 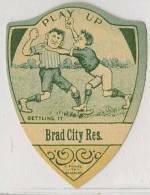 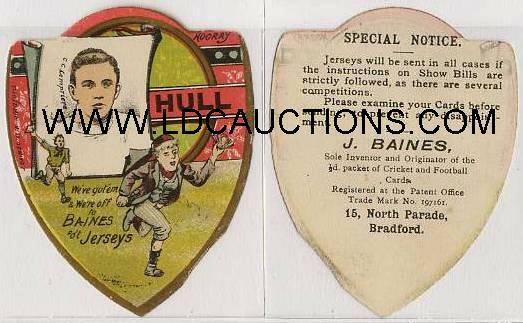 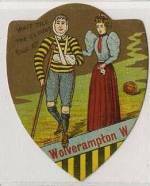 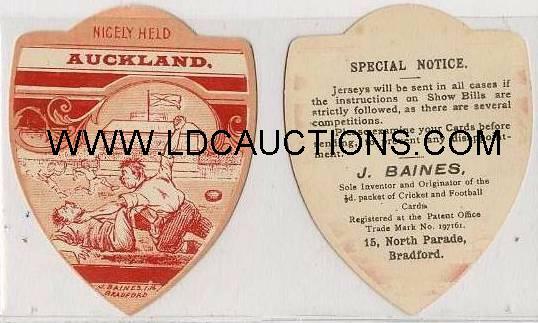 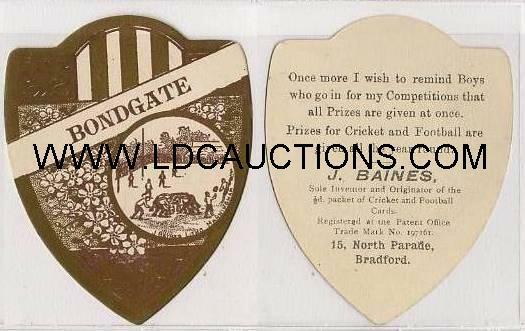 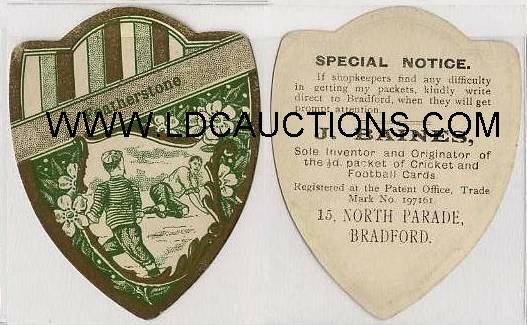 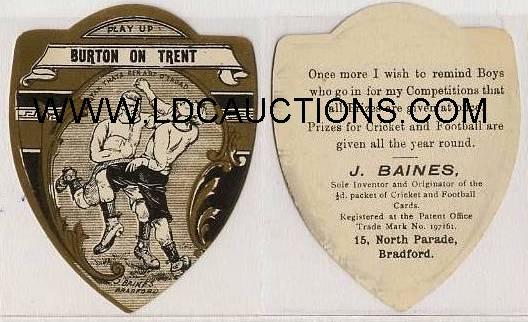 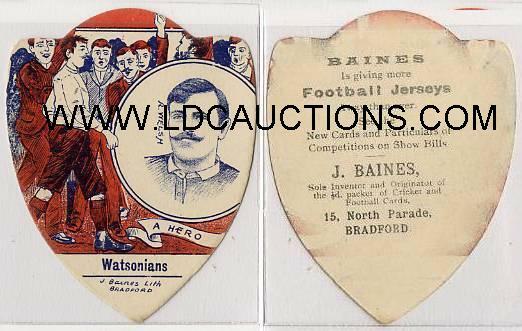 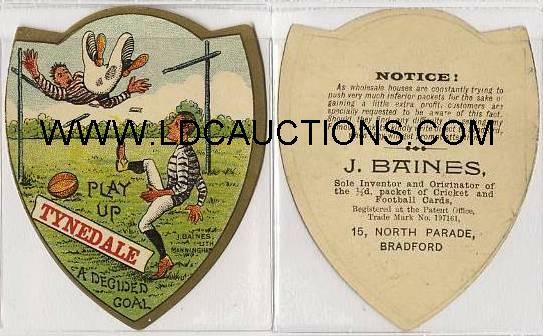 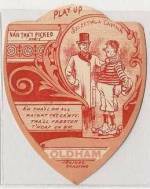 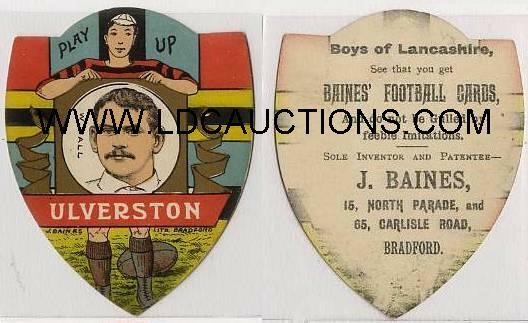 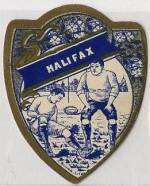 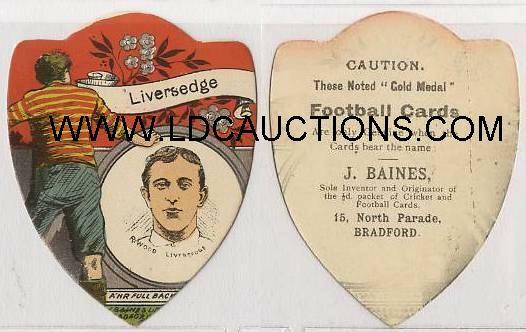 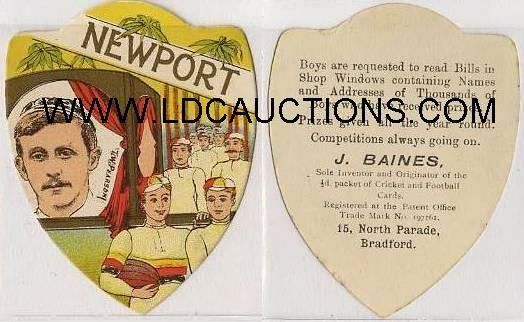 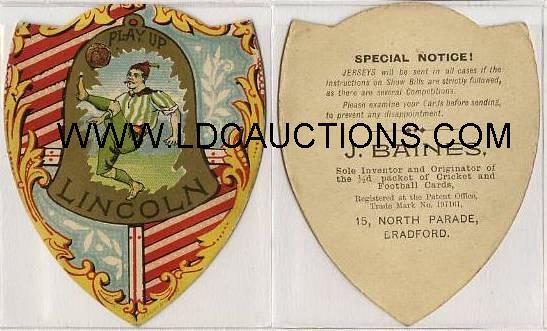 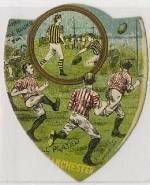 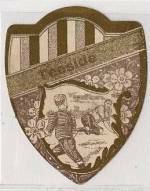 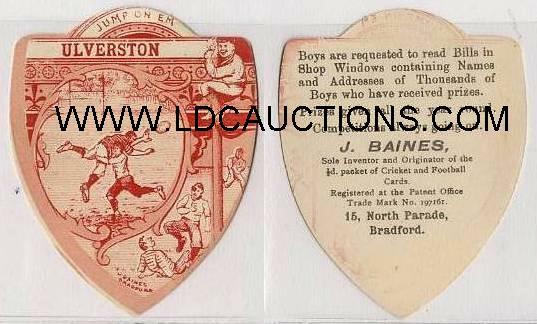 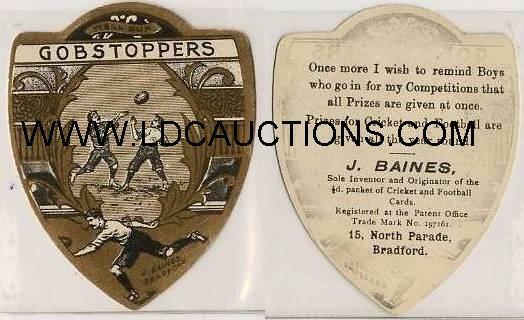 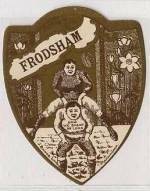 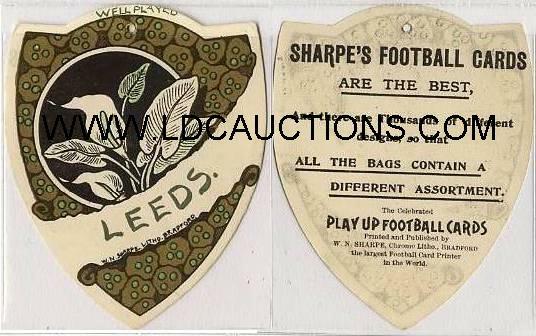 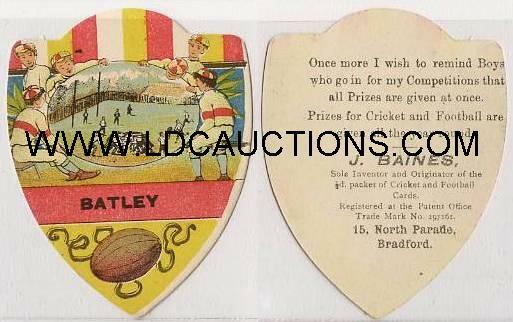 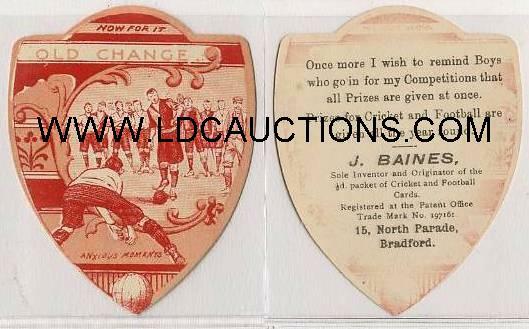 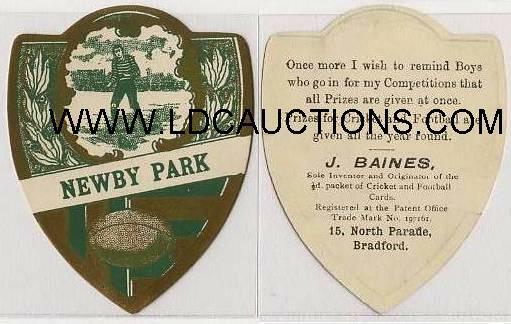 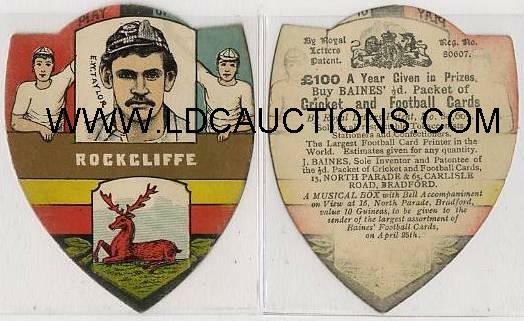 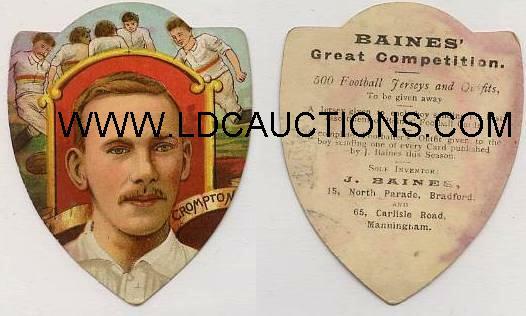 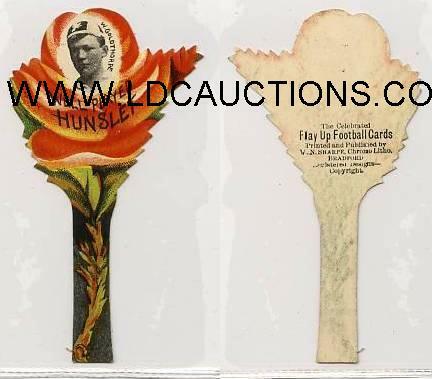 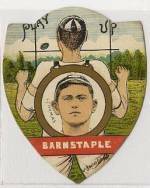 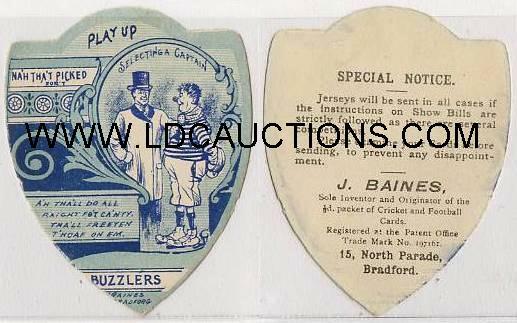 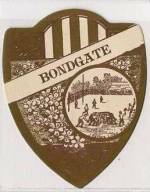 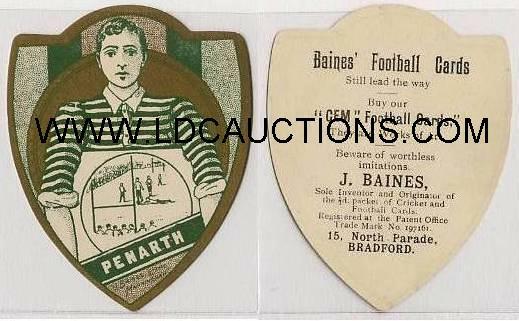 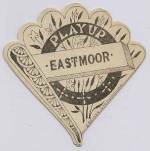 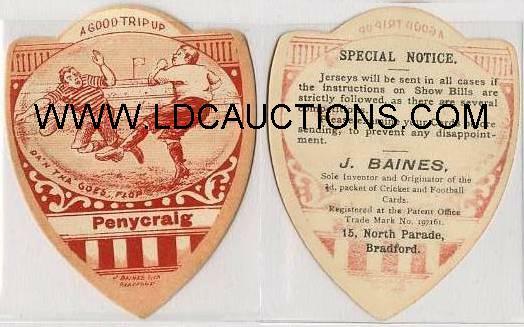 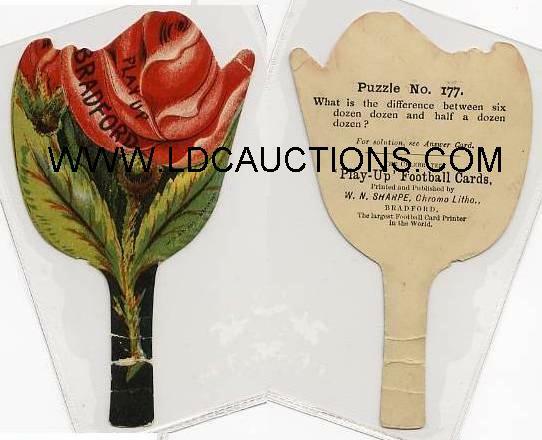 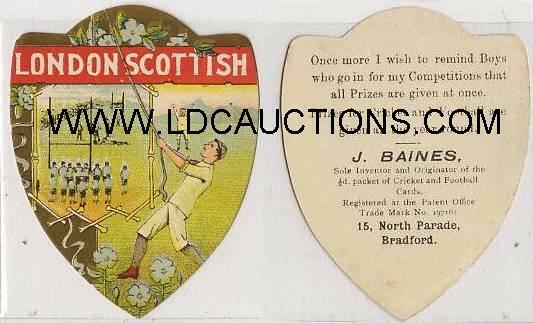 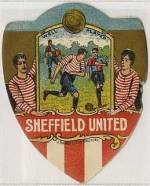 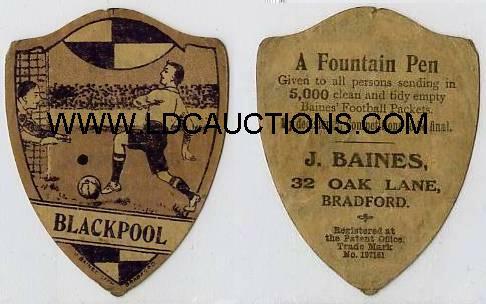 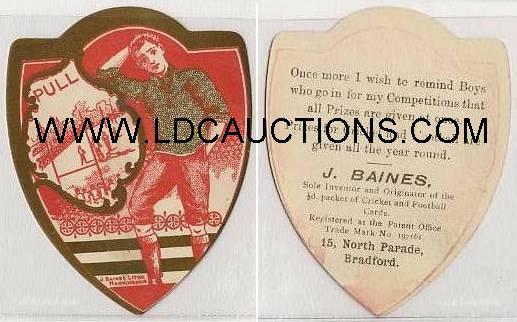 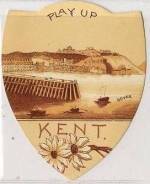 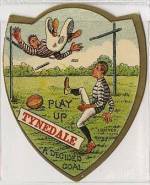 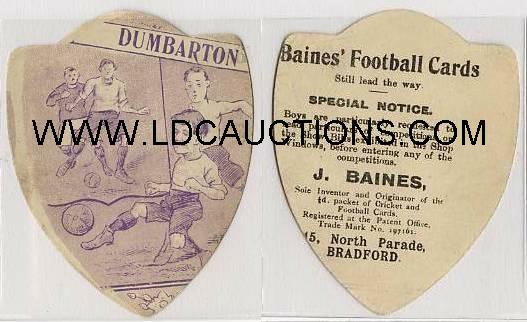 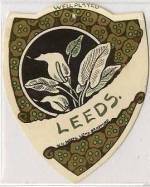 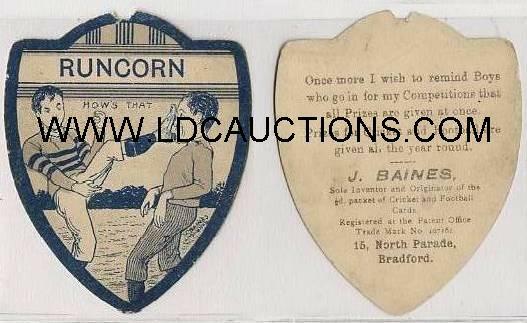 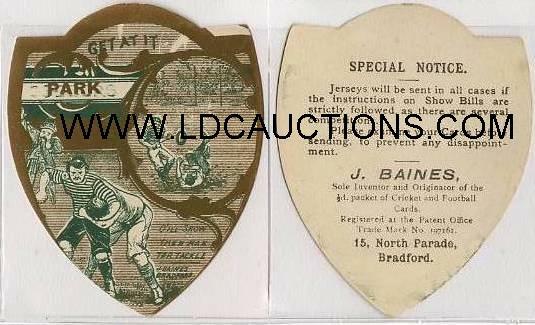 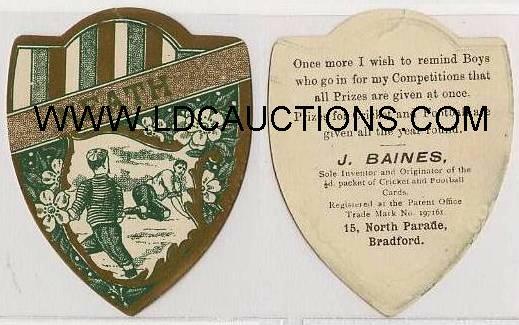 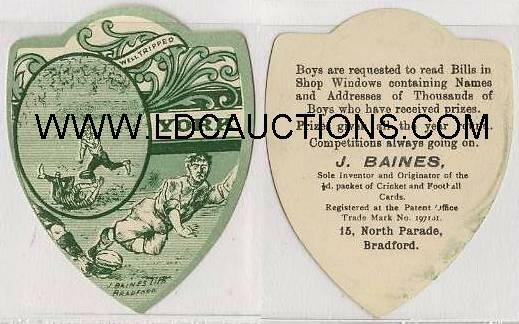 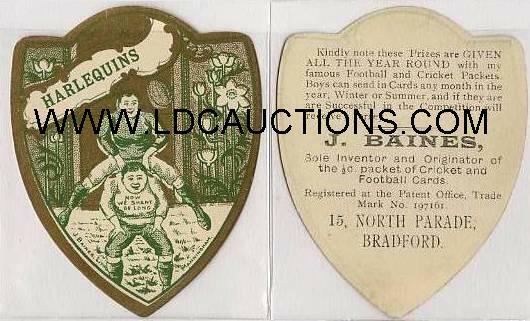 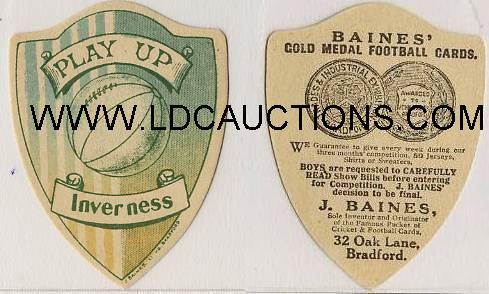 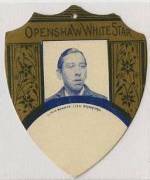 J. Baines Ltd of Manningham, Bradford began producing collectors cards in 1887. 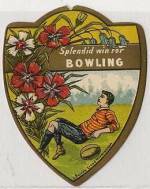 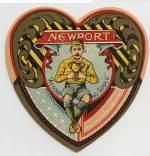 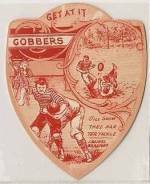 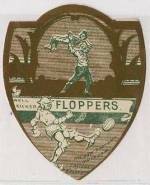 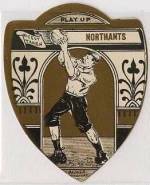 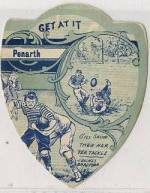 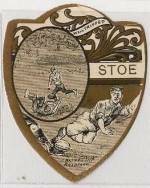 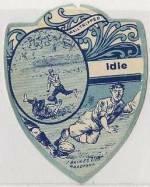 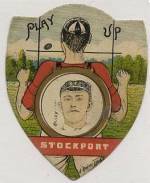 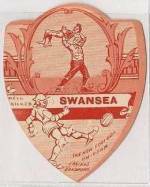 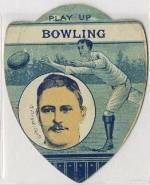 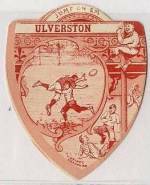 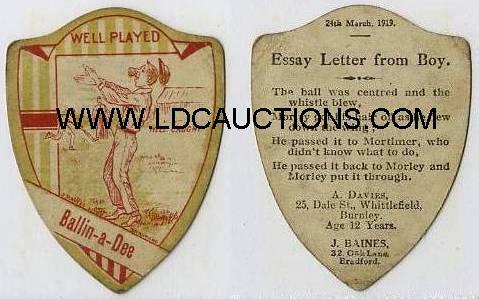 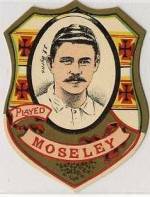 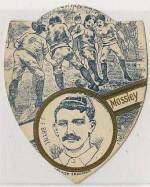 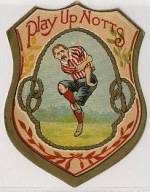 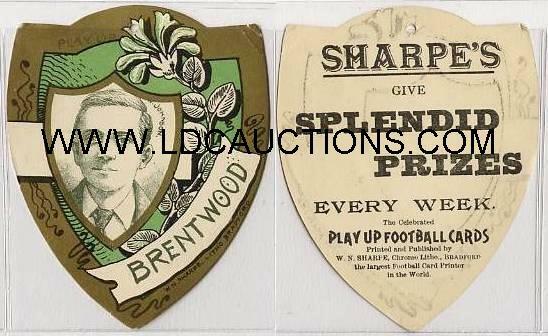 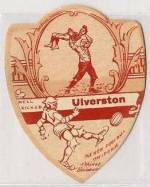 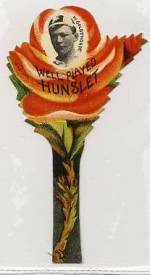 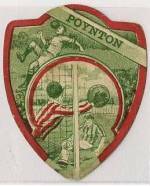 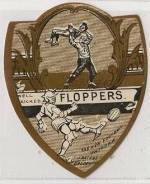 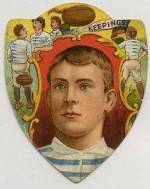 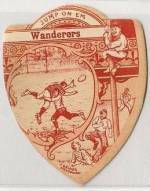 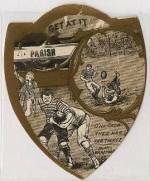 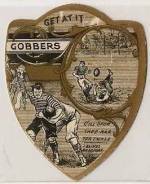 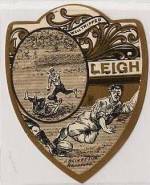 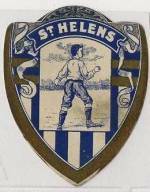 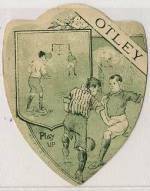 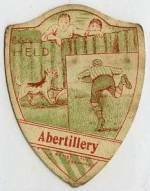 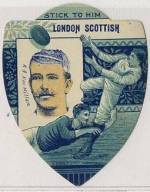 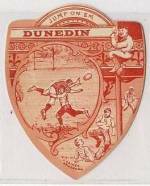 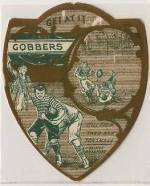 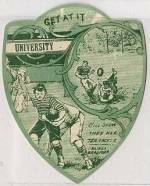 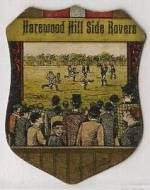 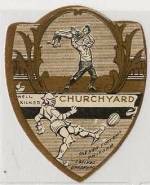 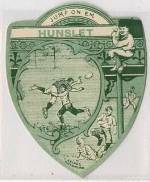 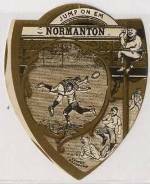 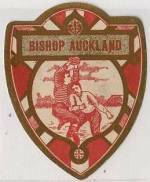 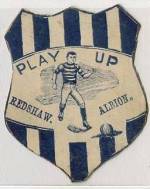 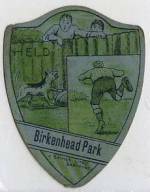 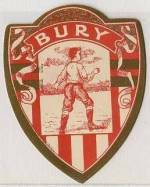 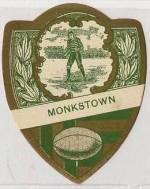 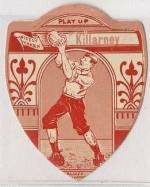 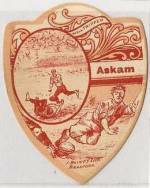 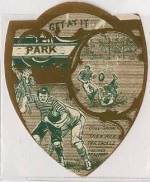 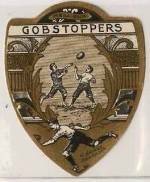 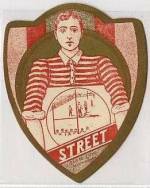 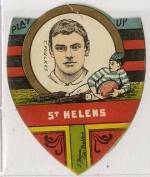 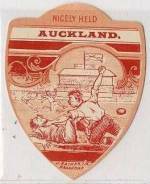 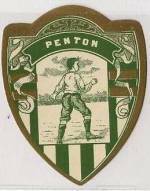 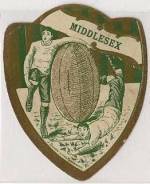 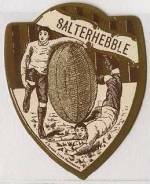 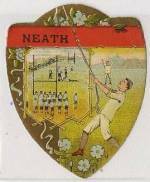 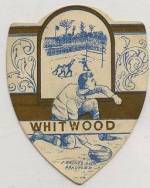 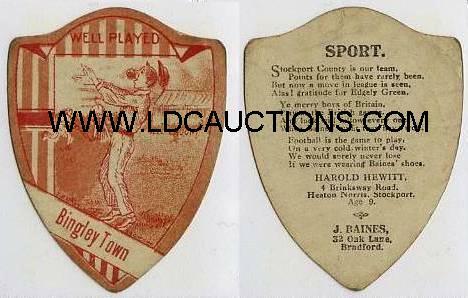 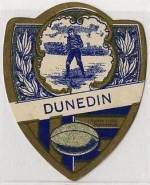 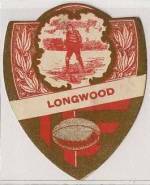 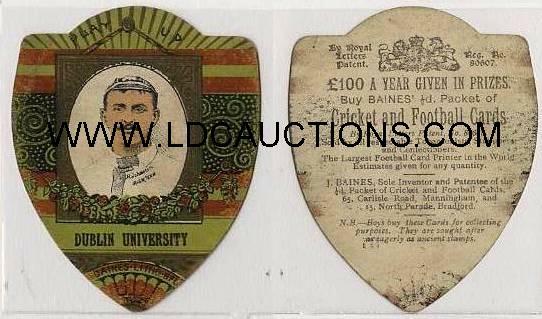 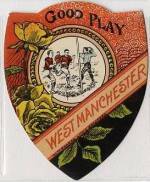 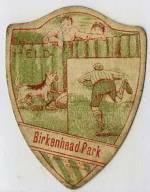 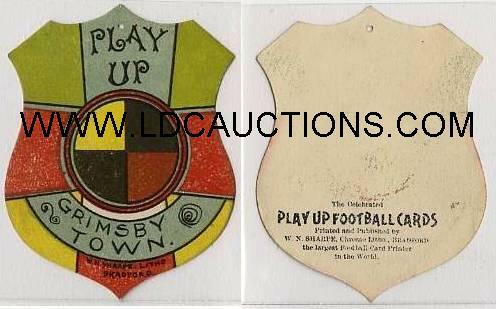 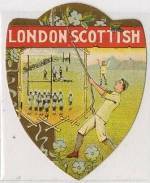 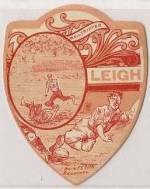 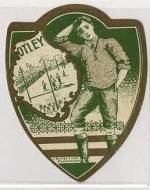 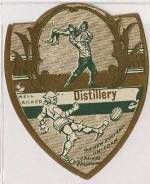 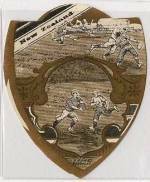 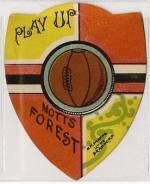 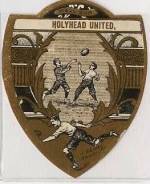 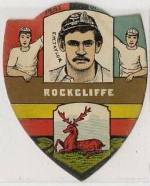 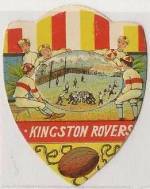 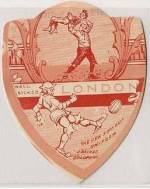 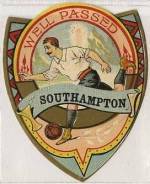 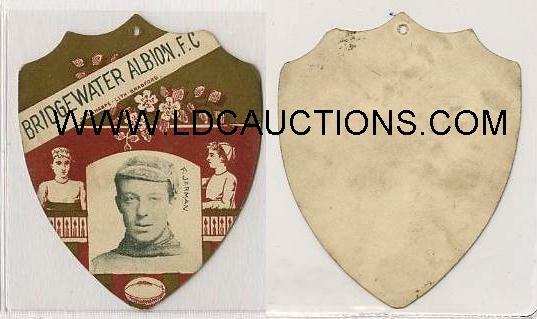 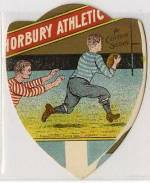 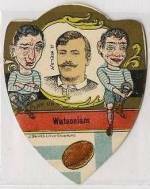 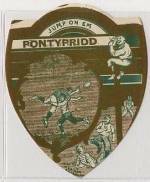 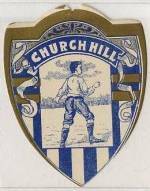 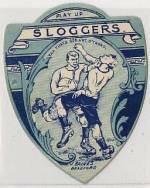 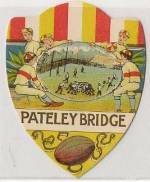 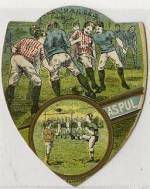 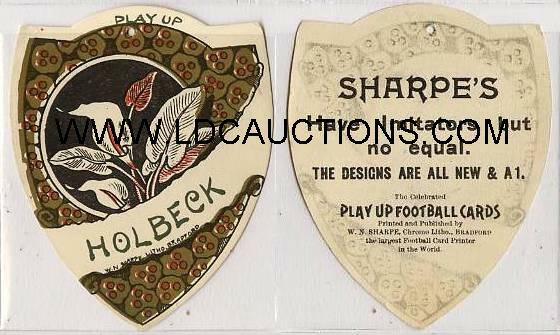 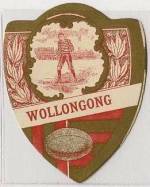 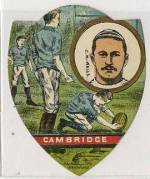 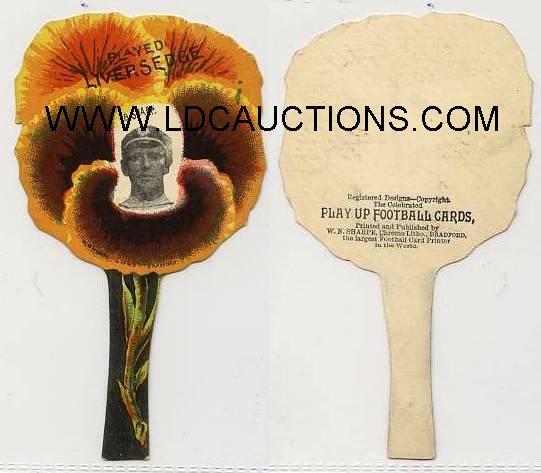 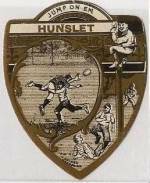 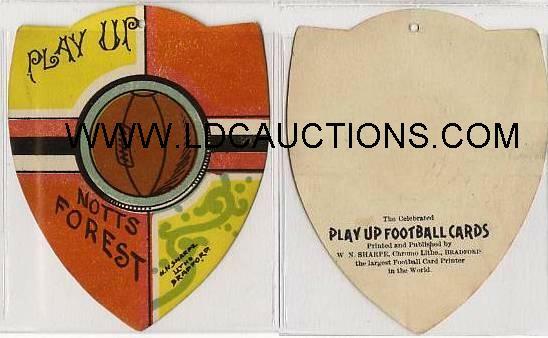 Rugby, Football (Soccer), Golf and Cricket were the mainstays. 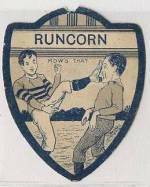 However, even school football got a look in! 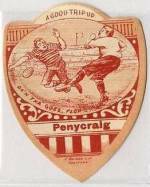 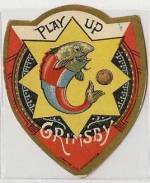 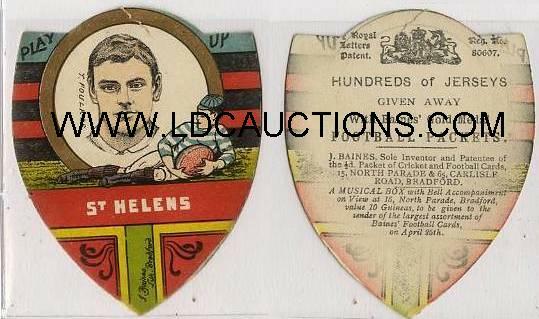 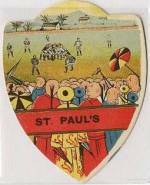 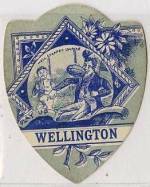 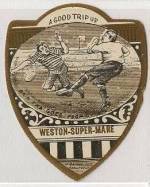 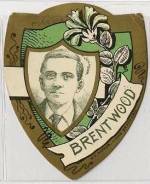 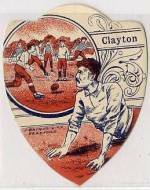 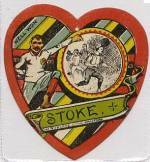 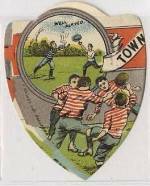 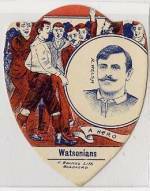 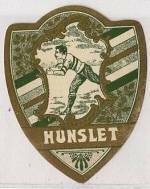 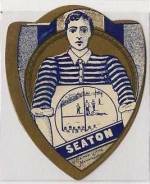 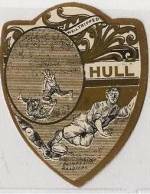 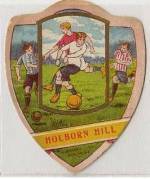 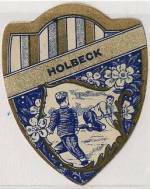 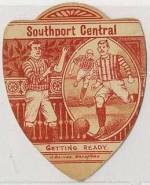 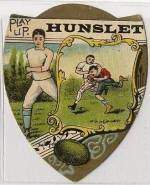 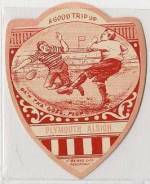 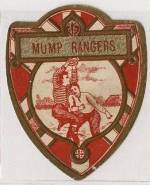 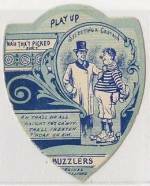 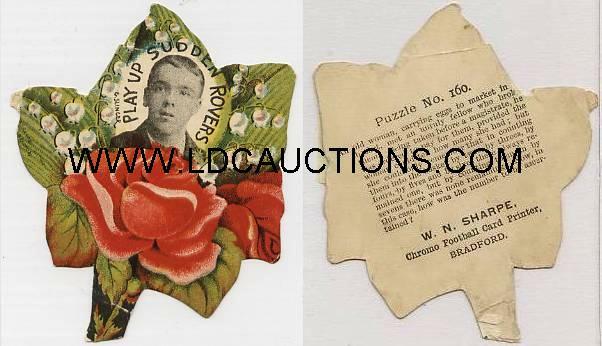 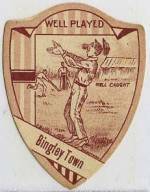 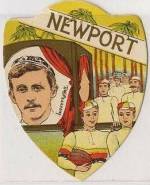 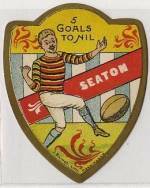 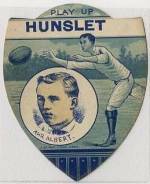 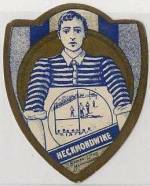 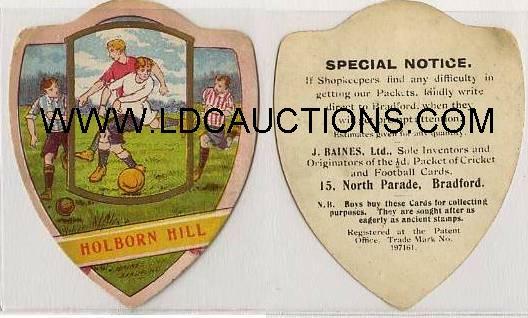 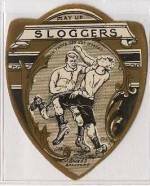 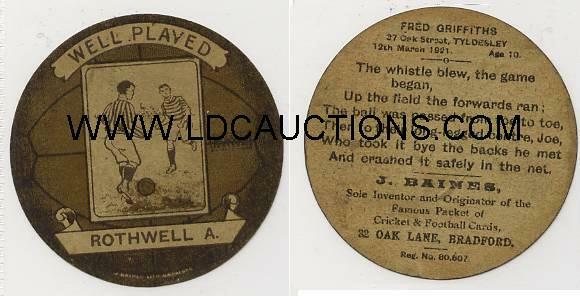 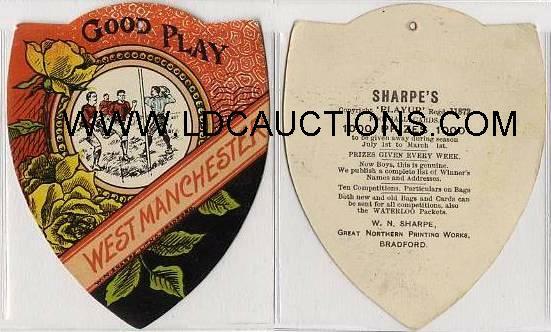 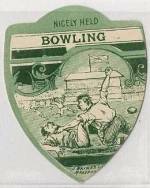 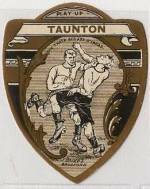 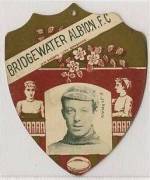 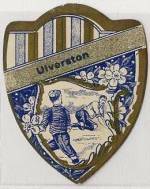 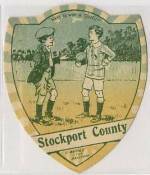 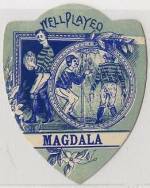 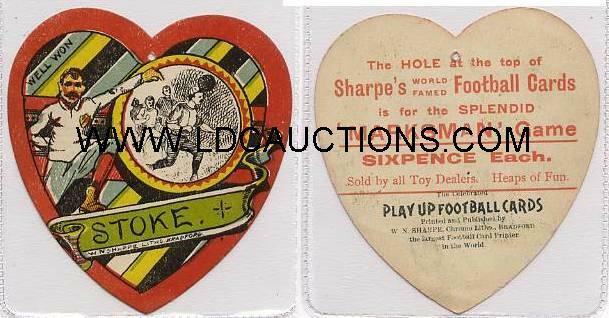 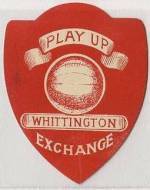 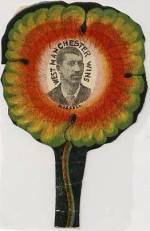 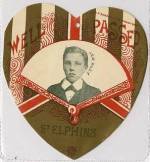 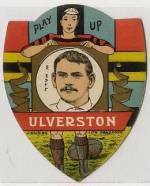 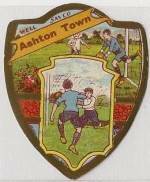 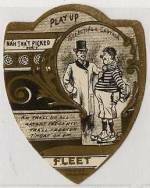 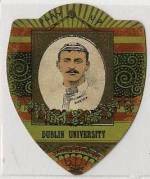 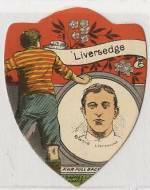 Sold in packets of six, the cards were avidly collected by generations of schoolboys. 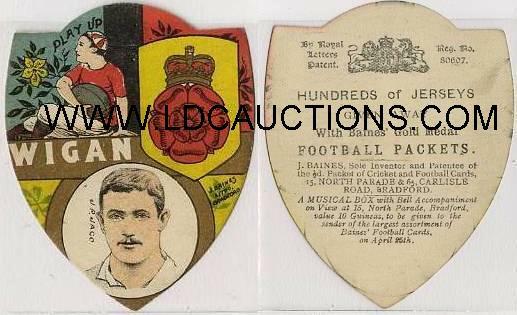 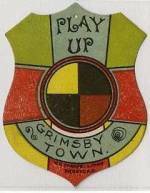 Baines encouraged the obsession by offering prizes to the person who returned the largest number of cards to his North Parade base. 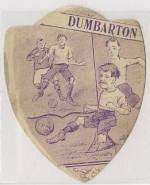 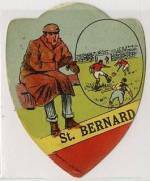 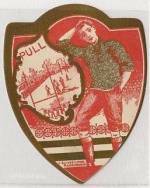 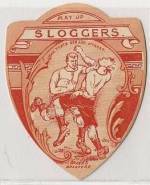 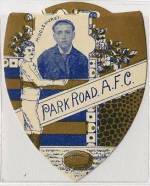 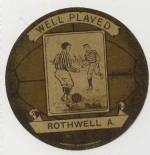 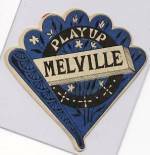 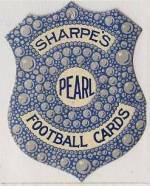 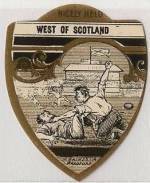 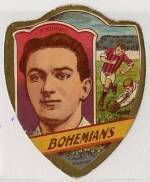 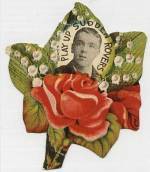 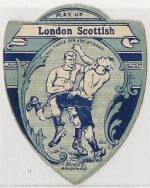 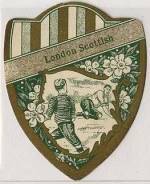 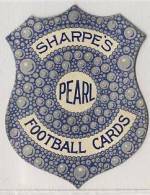 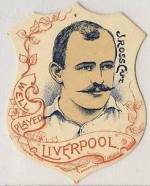 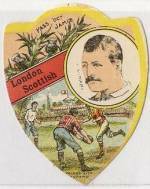 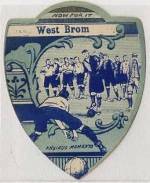 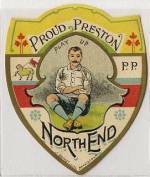 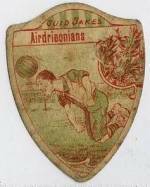 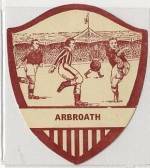 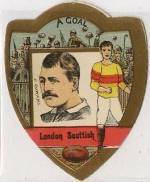 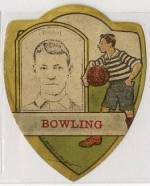 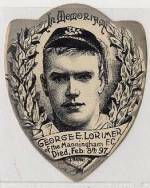 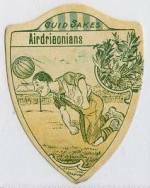 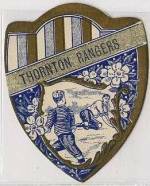 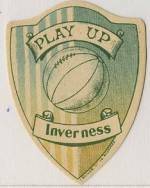 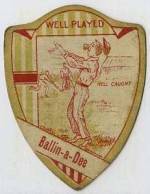 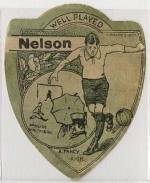 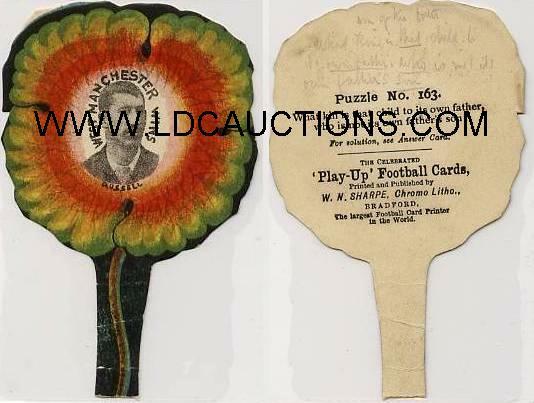 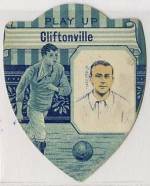 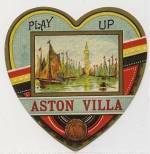 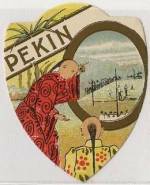 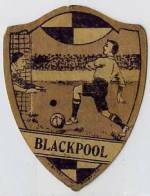 The craze hits its zenith in the 1919-20 era when a staggering 13.5m cards were sold across the North and Scotland. 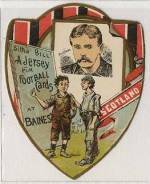 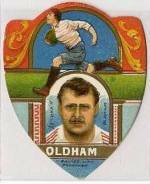 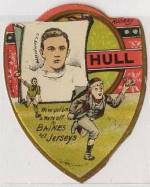 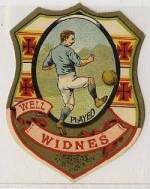 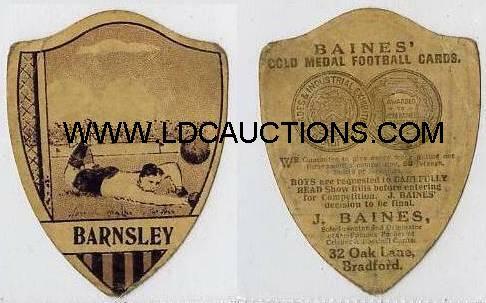 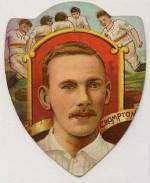 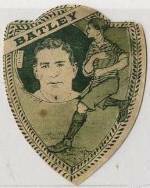 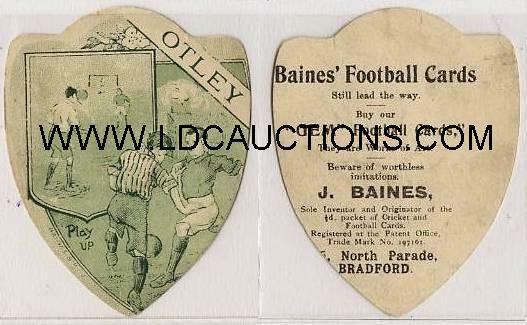 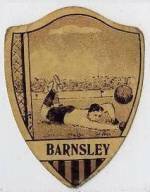 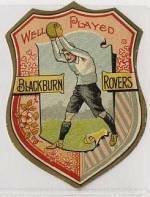 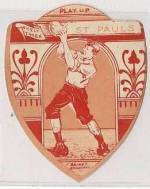 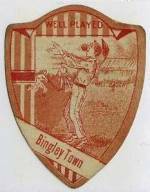 Baines retired when he sold his business to a Barnsley concern in the early 1920s. 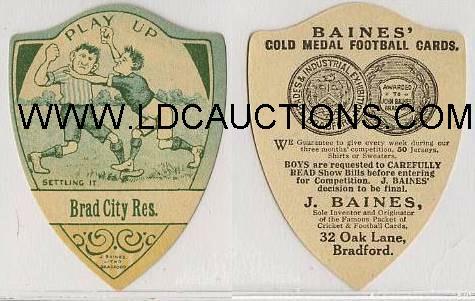 Otley (Gold/Green) Otley (Gold/Red) Parish Park Park Lane Wanderers Park Road A.F.C.